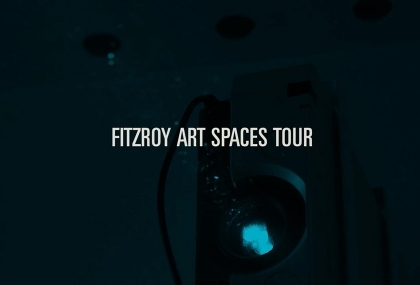 Fitzroy Art Spaces Tour (FAST) is an education program for teachers and students of VCE Studio Arts. The program offers a unique pathway to explore the contemporary art industry within a renowned local art precinct. There are two aspects to FAST; one is on foot – the FAST walking tour, while the other is online. 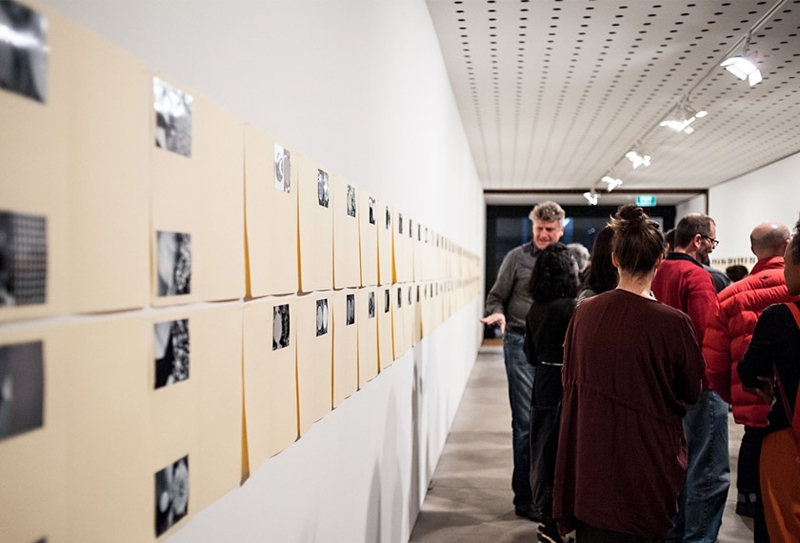 Participants experience various approaches to the exhibition and promotion of contemporary art and explore curatorial considerations involved in the display of artworks. FAST has been developed in consultation with the Victorian Curriculum and Assessment Authority (VCAA) with support from the Department of Education and Training (DET) through its Strategic Partnerships Program (SPP). Each FAST partner organisations is committed to safety and wellbeing of all young people and all have a zero tolerance for child abuse. The FAST program is guided by a VIT registered teacher. FAST tours are scheduled regularly on Fridays throughout May-September during the school year. Fitzroy is an inner-city suburb that has been gentrified over recent decades, with manufacturing and warehouse sites transformed into studios, galleries and apartments. Brunswick, Johnston and Gertrude Streets are popular shopping strips lined with designer specialty shops, cafés, bars and restaurants. 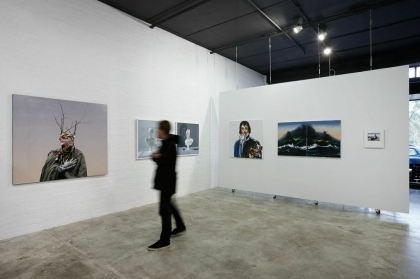 Fitzroy offers a diverse cultural scene encompassing leading contemporary public galleries, commercial art galleries,artist-run spaces and studios. Each gallery in Fitzroy is unique and caters for its own particular audience. Full payment must be received within 21 days prior to the tour date. 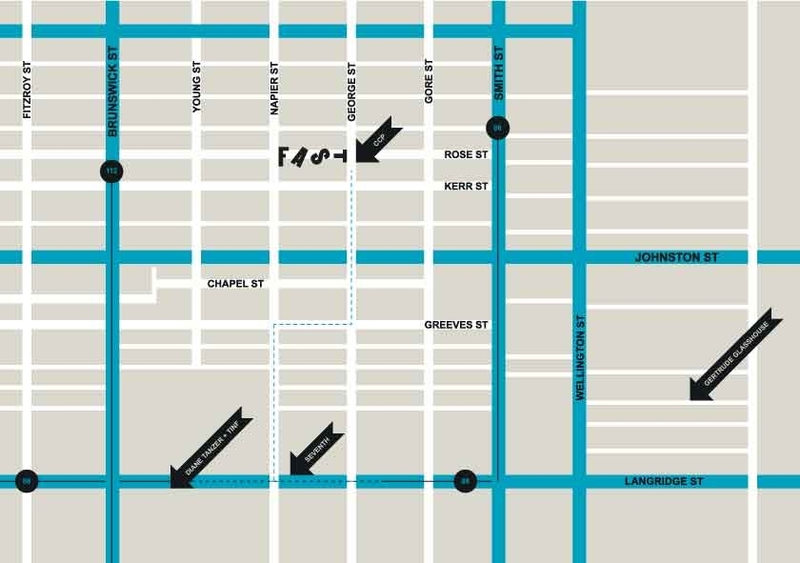 The walking tour provided by FAST is $17.50 per student (no charge for teachers). Each school that participates in the program must agree to the FAST Terms and Conditions prior to the commencement of the program. To download Terms and Conditions, click here. Cancellations more than 14 days prior to the tour date will incur a cancellation fee of 50%. No refunds will be issued for cancellations less than 14 days prior to the tour date. Requests to reschedule a tour will be accommodated subject to availability. Email education@ccp.org.au at least 21 days prior to the program. FAST walking tours commence at CCP, 404 George Street, Fitzroy, at 10am and finish at Gertrude Glasshouse, 44 Glasshouse Rd, Collingwood at 2.30pm. 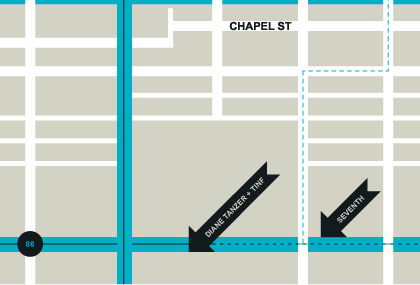 CCP is 100 metres from Smith Street (tram no. 86), 200 metres from Brunswick Street (tram nos. 11 or 112) and 100 metres from Johnston Street (bus nos. 200, 201, 203, 205 or 207). The City of Yarra Council offers in-kind support through a free community bus for outer-metropolitan and regional schools. If you are interested in accessing this service, please contact the CCP. There is limited, short-term parking available in Fitzroy. FAST is a full day walking tour so it is requested that all participants wear comfortable shoes and clothing suitable for staying outdoors for an extended period of time. All participants are required to be able to walk approximately three kilometres throughout the day. Please bring an umbrella, lunch, water bottle, pen and paper for taking notes, a smartphone or camera to document the exhibitions (please note: no flash allowed in the galleries). Participating teachers and students are required to bring lunch and a water bottle. There will be one supervised lunch break during the program with a sheltered venue available in case of rain. There is not enough time to visit cafés during the program. For further enquiries about FAST walking tours, contact CCP Education Consultant Melissa Bedford. 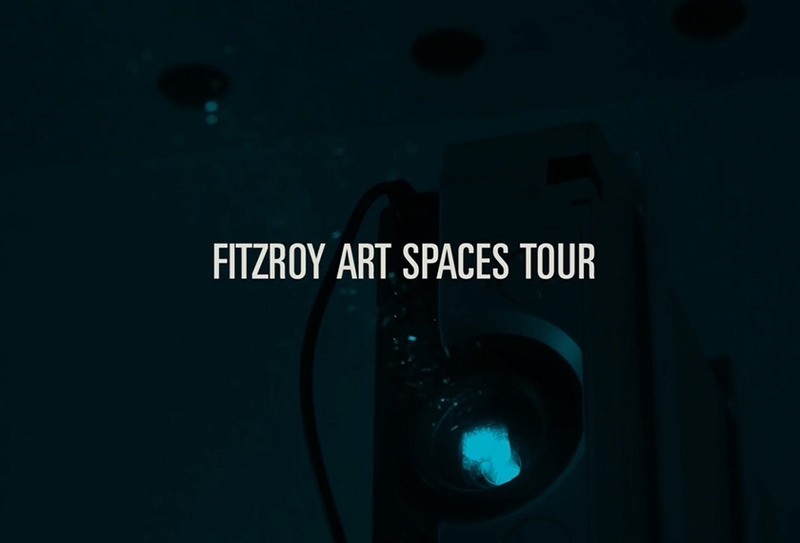 The Fitzroy Art Spaces Tour (FAST) is an educational guided tour of four Fitzroy art galleries, representing a microcosm of the contemporary visual arts industry. You can find out about each organisation by visiting their website, listed below each profile. The Art of Publishing: An Exhibition of MACK Books, 6—21 January 2018, Centre for Contemporary Photography. CCP is a public gallery that was established by the photographic community in 1986. Exhibitions feature photography and video from emerging to established artists. The program includes individual, group and curated exhibitions, featuring photomedia by local, interstate and international artists. CCP has five exhibition spaces: four internal galleries and the Night Projection Window, viewed from the street after dark. 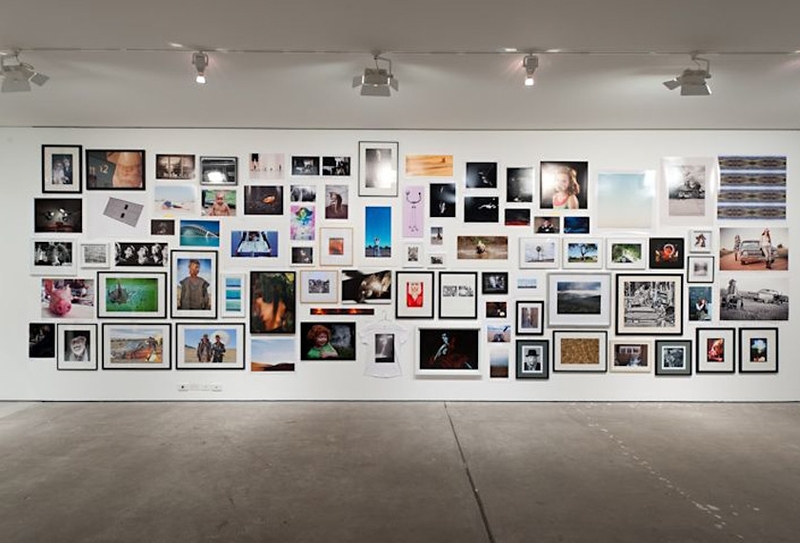 The Centre for Contemporary Photography (CCP) is a publically funded organisation that presents a regular and varied program of exhibitions to the general public. As a not-for-profit organisation, CCP is eligible to receive a portion of its funding from government. However, it needs to generate revenue through other avenues such as ticketed public and education programs, fundraising, bookshop sales, philanthropy, sponsorship and partnerships with the private sector, and through artwork sales. Any profits generated by not-for-profit galleries are reinvested into their future programs. Artists who exhibit at not-for-profit public galleries do so in two main ways; by invitation and application. Public galleries endeavour to pay artists a minimal ‘artist’s loan fee’. CCP pays between $300 and $1200 to each exhibiting artist depending on the scale of the exhibition space. Public galleries also commission artists from time to time to make new work and need to secure a commission fee for the artist. For more information about fee structures, visit the National Association of Visual Arts (NAVA) website. A third way for an artist to exhibit at CCP is through the open-entry exhibition known as Salon. This popular annual exhibition offers a unique opportunity for hundreds of members of the photographic community to show their work. For more information about public galleries, visit the Public Galleries Association of Victoria (PGAV) website. You can also visit Victoria’s largest public art gallery, the National Gallery of Victoria (NGV). Shelley Lasica, The Design Plot, 2017, performance shot at Gertrude Glasshouse. Noriko Nakamura, Erosion, 2017, Installation shot at Gertrude Glasshouse. Image Matthew Stanton. Open Thursday – Saturday 12pm – 5pm. Gertrude has been building the careers of Australia’s artists for over 30 years. Since our establishment in 1985, Gertrude has played an essential role in the visual arts sector, shaping the careers for many of Australia’s most celebrated artists. We are an incubator and launching pad for contemporary artists. Our artistic program – including our studio and exhibition program – is unique in its equal emphasis on the production and presentation of contemporary art. This enables us to support artists to explore new ideas and present risk-taking work at pivotal points in their careers. Gertrude's alumni distinguish themselves in major Australian and international exhibitions and collections, for example, 17 of the 20 artists representing Australia at the Venice Biennale since 1995 have been Gertrude Studio or exhibiting artists. Gertrude gives audiences unique insight into the creative development of artists. Our audiences engage with risk-taking, formative moments that define artist careers. Gertrude also gives teachers and students of all ages inspiring learning experiences in the public presentation and behind-the-scenes production of art through engaging curriculum-aligned educational programming. Gertrude manages two sites: Our main premises at 21-31 High Street in Preston South which is the home for our major exhibition program, sixteen artist studios and offices; and Gertrude Glasshouse, our satellite exhibition space in Collingwood. SEVENTH is a not-for-profit artist-run initiative (ARI). The organisation is dedicated to supporting artists from a diverse range of disciplines at different stages of their career. 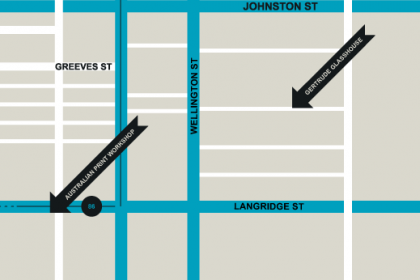 Situated on Gertrude Street, SEVENTH provides a platform for experimentation that supports creative networks and connects the local art community with the global sphere of contemporary art. Artist-run initiatives (ARIs), such as SEVENTH, usually operate as co-operatives (co-ops) run by a board of members. Running for 10 years now, SEVENTH has successfully secured a number of grants and government funding which is unusual for a young company. Artists who exhibit in ARIs are usually emerging artists who are not represented by a commercial gallery and who want an opportunity to display their work to the public. Some artists prefer to exhibit in these types of venues because they can retain control over the creative intention of the work without needing to appeal to the art market. These venues are often good places to see challenging and experimental art. Exhibition programs are usually determined collectively by the co-op, with artists submitting a proposal to exhibit several months ahead of time. Typically artists do not have to pay a commission on works sold in an ARI space, but instead, they pay a fee to the gallery to cover the running costs and are required to watch the gallery during the exhibition period. For more information about ARIs, visit the Crawl Inc. website. 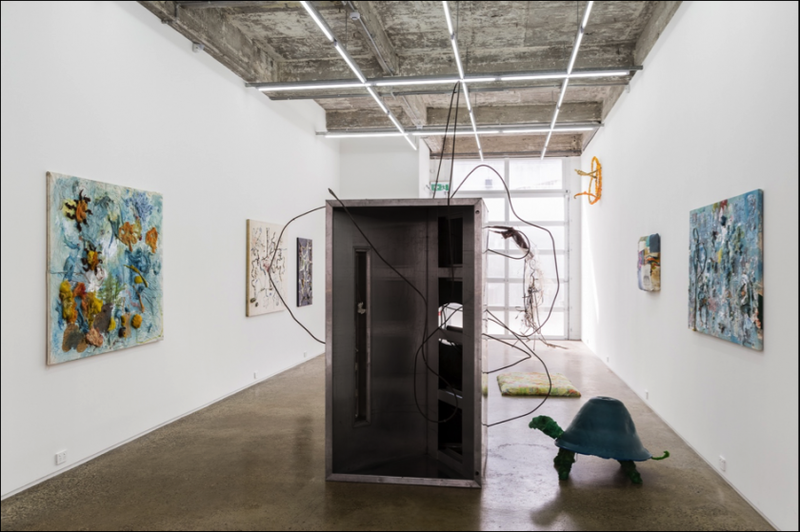 Dianne Tanzer Gallery + THIS IS NO FANTASY was established in 2013 by Nicola Stein and Jemma Clark (formerly of Helen Gory Galerie) and Dianne Tanzer (Director, Dianne Tanzer Gallery). Together we are dedicated to promoting and exhibiting outstanding contemporary artists in Australia and increasing their visibility internationally. We represent a select group of artists whose practices are defined by integrity, critical engagement and a strong personal aesthetic. Our dynamic annual program of solo shows, curated exhibitions and artist projects is complemented by our focus on off-site exhibitions and regular participation in international art fairs and public projects. Describe the nature of your organisation as a not-for-profit enterprise. How does it continue to operate successfully? CCP is a not-for-profit membership organisation. The principal funding (33%) is received from agencies, the Australia Council of the Federal Government and Creative Victoria. Other critical income is generated through memberships, user-pay services, sponsorship and fundraising. Government funding does not cover the costs of renting our gallery and paying our staff, so we must be resourceful and work hard at generating income to maintain our exhibitions and public programs. Briefly describe the type of exhibitions that CCP presents. CCP’s mission is to exhibit photomedia, and we interpret this is the widest possible way, to include all lens-based work, still and moving image and three-dimensional work. We exhibit the broadest possible interpretations of photography. Because photography is popular and ever present in advertising and social media, we are interested in unusual, thoughtful approaches to photomedia, which challenge the way we think about the medium, the technology, the history of photography or the world more broadly. 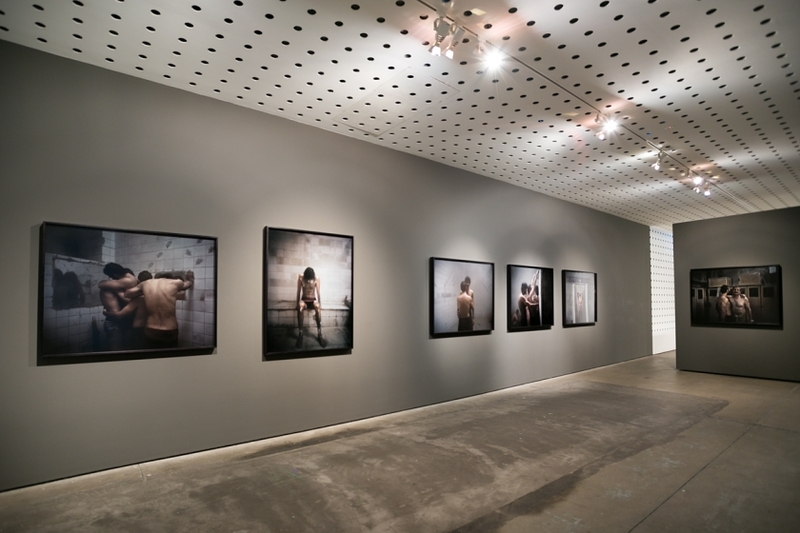 CCP presents exhibitions in our space in Fitzroy, as well as off-site tours and exhibitions, such as at the Melbourne Art Fair and by participating in international events such as PHOTOFAIRS Shanghai. 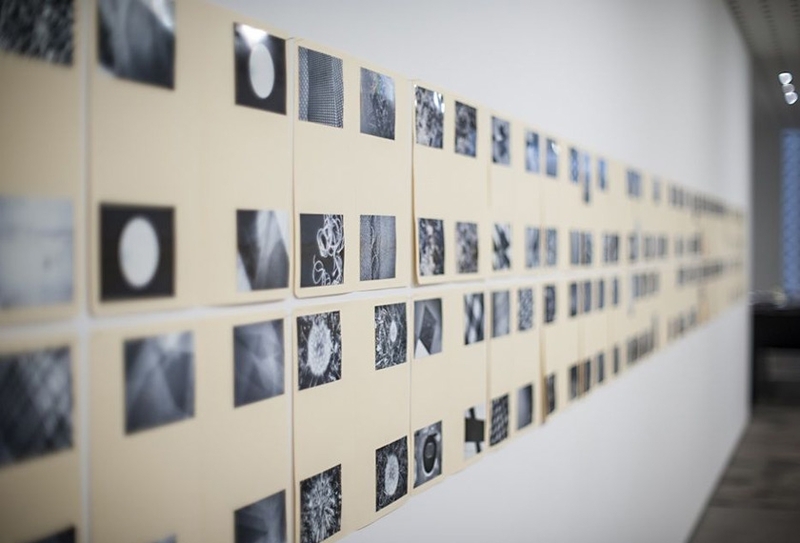 CCP exhibitions range from traditional analogue photography to digital photography, camera-less photography such as photograms, through to animation and video. The work exhibited can be exciting and challenging for its content or medium. The artworks may be roughly pinned to the walls or magnificently printed and framed -- all are valid experiences for artists and audiences. CCP also presents award exhibitions to which members of the public can submit work, such as the open-entry exhibition and award, Salon. What are the main ways in which artists are selected to exhibit within your gallery? There are a number of ways in which an artist can show at CCP. Principally, artists submit a proposal in response to a mid-year call for exhibition in the following year. All proposals are considered by the CCP Exhibition Advisory Committee, comprising of the CCP Director, curators, other staff and external experts. On occasion, CCP approaches an artist and invites them to present a major solo exhibition or participate in a curated exhibition. 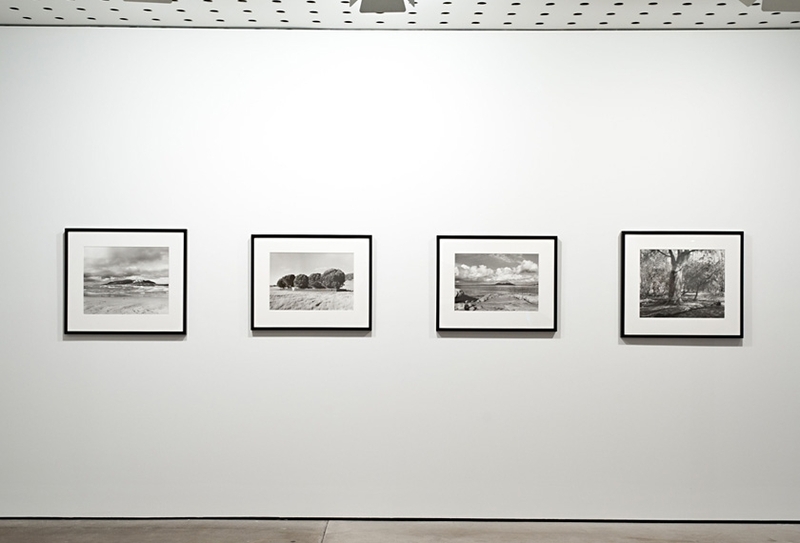 Most CCP exhibitions are solo exhibitions in one of our five galleries, drawing from work in the artist’s collection. These exhibitions enable visitors to gather an intimate idea of an artist’s current work, without telling the whole story of their development. Every two-three years we curate an in-depth exhibition revealing a longer look at the artist’s development over time, showing work from over 20 years (for example) and borrowing work from collections. These are large exhibitions that fill the entire gallery. A curated exhibition is where a curator selects either an individual artist or, more often, a range of artists and brings the work together under one title, a particular idea, or theme. Curated exhibitions can be proposed to CCP by artists or curators, and are assessed on an annual basis, like solo exhibitions. CCP also curates exhibitions. In this case, the curator will go out and seek work from selected artists. What does your gallery do to promote exhibitions and develop new audiences? CCP uses many approaches, including email invitations to over 8,000 subscribers, and social media channels including our 16,000 Facebook followers and 19,000 Instagram followers. In 2016 we registered over 95,000 visits to our website. CCP also uses email invitations, with an ‘open’ rate that is more than twice the industry average. Our social media channels remain a highly effective form of communication, requiring relatively few resources. Another effective way of cross-promoting CCP is by participating, through on or off-site exhibitions, at festivals such as the Virgin Australia Melbourne Fashion Festival, Melbourne Festival, Melbourne Art Fair, Midsumma and Next Wave Festival. Editorial is one of the most time-honoured ways of getting our message out. By this, I mean reviews, articles, interviews and listings in newspapers and magazines. CCP is relatively effective in gaining media attention. Who are the key staff working within your organisation and what are their roles? How did you become the Director of CCP? Briefly describe your career path up to this point. I have been the Director of CCP for thirteen years and have been working in the arts since graduating with a Fine Arts, and History and Philosophy of Science degree (from The University of Melbourne). My previous position was as chief executive officer of the National Exhibitions Touring Support (NETS) Victoria. Prior to this, I worked as a curator and as an arts writer over many years. When working in small organisations one gets used to working in many different roles, from challenging, interesting activities such as developing an exhibition or a policy for CCP, through to taking out the bins and serving drinks! Having a university or art school degree is useful, but having on-the-ground experience is also important. Many people start their careers juggling study with voluntary work in the sector, and then casual experience in an art museum or gallery. Museum/gallery professionals require an unusual breadth of practical, theoretical, curatorial, promotional, financial and interpersonal skills. What is the most rewarding aspect of your professional role? There are many rewarding aspects of my work. I enjoy being an advocate for contemporary art, highlighting the importance and value of the artists and their work in contemporary life and society. Working with artists and writers is exciting and often challenging. 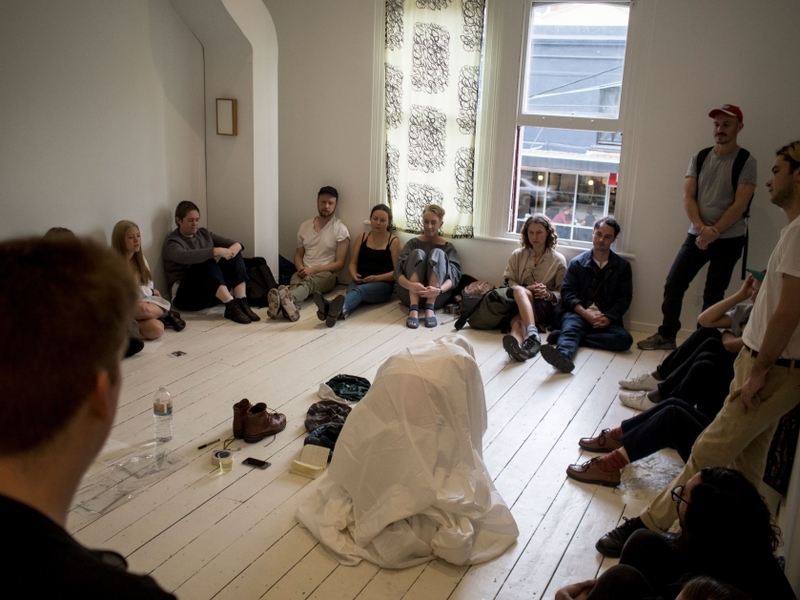 Being open and sensitive to their needs and desires, understanding their work and communicating this effectively is critical, as is providing a stimulating and sympathetic context for exhibiting work. As Director, I am less engaged on a day-to-day basis with artists, unless I am curating an exhibition or project. Overall, I would say that ensuring that this small and highly effective organisation is flourishing, ambitious and stable is my overriding objective and accomplishment. My favourite time to visit CCP is on a Saturday after openings, when artists join staff and visitors for a really informal walk through the gallery, discussing their work and taking questions. How do you see your organisation’s contribution to the visual arts sector within the local context of Fitzroy and Australia? What about its global reach? CCP has been located in Fitzroy for most of its 32 years. The gallery plays an important role in the ecology of the arts in Australia but is most active on the local and national context, and at the entry and mid-career level. Globally CCP will exhibit 26 international artists throughout 2018. We present solo exhibitions by artists in the first few years of their practice and provide an opportunity for artists to gain professional experience in these early stages of their career. We provide an opportunity for more established artists to take a risk with a new direction. 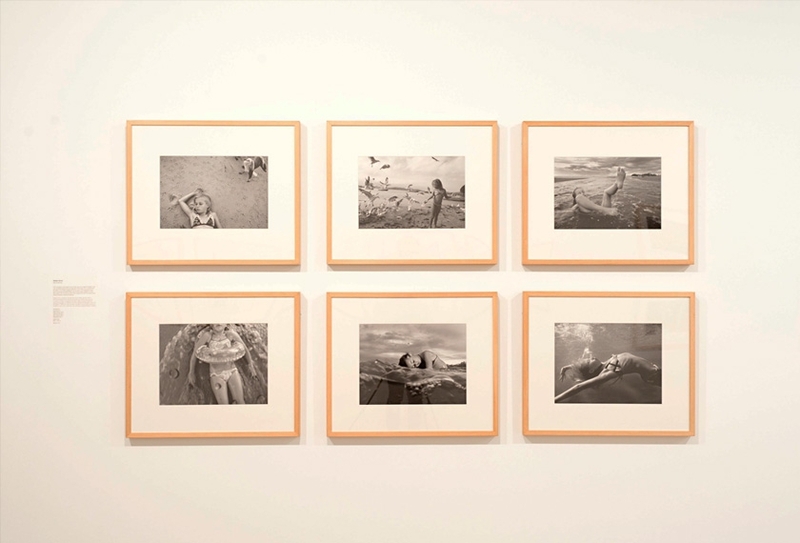 Sometimes, artists better known for non-photographic practice present their photography at CCP. There are countless opportunities at CCP for writers, educators and critics to reach broader audiences though lectures, talks, seminars and publishing. Most of the work we exhibit is new or recently made, for example, we don’t often borrow work from collectors to exhibit. However, every two-three years we present an in-depth survey of a mid-career photographic artist, drawing across say, 20 years of practice. These exhibitions often also tour across the country to regional galleries. CCP is a media-specific gallery, devoted to photography and video, or indeed any work that is lens based, or related to photomedia. Being a media-specific gallery is unusual amongst most public galleries, with few other examples in Melbourne, with the exception of Australian Centre for the Moving Image (ACMI) and Monash Gallery of Art (MGA), Craft Victoria, and the Australian Tapestry Workshop. When CCP started 32 years ago, it was the only public gallery and one of only a few commercial galleries dedicated to photography. It was difficult then to get an idea of what was happening in the world of art photography. Whereas now, not only is photography ever present in public and commercial galleries, commercial photography is all over the streets on billboards, hand-held devices and the internet. Photography is everywhere! CCP is a place where photography and video can be experienced outside of a commercial context: the work we exhibit is not motivated by commercial needs. Through our spaces, we provide a special context for engaging with how photography is being used, being spoken and written about by artists and writers. Our exhibitions can be experimental and challenging. CCP is also a place where the public can get involved. We run workshops, talks and the public can exhibit their work in the Salon – this is the largest national open-entry award (online applications open from around July each year). Here are a few facts and figures about CCP for 2017: 601 artists exhibited with CCP; 31 exhibitions were created and presented; 342 people were paid CCP Members; 2,805 volunteer hours were donated; 25 practical photography workshops were presented, as was a community youth arts project/exhibition; 16 free artist talks; 13 free illustrated lectures; 2 exhibition catalogues were produced and 20 education talks and seminars were presented to school groups. Who visits your gallery regularly? Is there a particular audience/clientele? In 2017, the total attendance for CCP, including touring exhibitions, events and off-site projects, was in excess of 150,000 visitors. Our research reveals that the majority of these visitors were female, aged between 26 and 35 years old, working full time, well educated, and living in the inner city. Practicing and student artists were also a significant group in the survey. Does your organisation have a volunteer or internship program? If so, could you explain the value of this program? CCP would not function effectively without the help of our volunteers. Volunteers undertake critical, regular activities including: sitting at the front desk and taking visitor enquiries; collating and documenting media; establishing and managing award exhibitions; collating exhibition proposals; invigilating (sitting in the gallery if there is particularly fragile work); assisting curators in developing and managing exhibitions; assisting artists to install and de-install their exhibitions; painting the gallery walls; managing the bar at openings; and undertaking visitor surveys. CCP’s Board of Directors consists of expert volunteers including business, academic, law and arts professionals who donate their time and expertise. What do you see as the main challenges for your organisation at this point in time? This is really simple to answer: to secure funds to enable CCP to be an effective and sustainable organisation creating programs for artists of local, national and international significance and, further, to secure long term and sustainable housing. What have you observed to be the greatest changes/trends in the broader visual arts sector over recent years? If I restrict my comments to photomedia, the rise of citizen journalism and image sharing technologies have greatly expanded the field. There are more people making art, those that identify as artists are often highly educated coming through the tertiary system, or they might simply commence exhibiting independently without formal education – all are valid positions. When presenting their work to public galleries, artists may have already been exhibiting for a few years in the thriving artist-run initiatives aspect of the sector. Opportunities for commissioning documentary and reportage photography have diminished as the print media (newspapers and magazines) contracts due to loss of advertising revenue, thus presenting new challenges to photographers who, in response, seek exhibitions in public galleries and become more active in creating an online presence for their work. How has your organisation adapted to these changes? CCP programming has always been responsive to the sector, in both our annual call for proposals and our curated exhibitions. What do you hope for the future of the visual arts sector and your organisation? I hope there is further support of artists to make work, for curators and writers to flourish and for there to be sustainable opportunities for artists to exhibit their work, to reach audiences and to engage with the community. I hope that there are opportunities for emerging and established curators to create exhibitions that interpret contemporary practice and expand the way artists and audiences engage through exhibitions, talks and publishing. I hope there will be more opportunities for artists to travel, to exhibit at CCP and abroad, and for there to be more available funding to create illustrated catalogues and pay writers to write about CCP artists. Describe the characteristics of Gertrude Glasshouse as a gallery and how it relates to Gertrude Contemporary and the studio program? Gertrude Glasshouse is a state-of the art gallery space located in the heart of Collingwood. The converted warehouse was designed by architecture firm SIBLING in 2015. The gallery is in the white cube style, with polished concrete floors and a raw concrete ceiling in celebration of the building’s industrial history. Rows of vertical and horizontal fluorescent tube lights mirror the grid design used on the front foyer. Gertrude Glasshouse is home to the Gertrude Studio Artist solo exhibition program. During their two-year residency at Gertrude, every artist in the studio program is invited to develop an ambitious, new project that extends upon their work in the studios. Glasshouse is also used to present select additional exhibitions that align with Gertrude’s commitment to supporting the production of ambitious projects and discourse. How does Gertrude Contemporary sustain its operations over time? Gertrude was established through a partnership between the art community, government support and private philanthropy. Both the Australia Council for the Arts and the Victorian Government have supported Gertrude Contemporary’s program and operations since our establishment. This partnership of supporters remains an integral part of the organisation today. Gertrude is supported through four year organisational funding from the Australia Council for the Arts; the Visual Arts and Craft Strategy, an initiative of the Australian, State and Territory Governments, and the Victorian Government; project-based grants from government and philanthropic organisations; corporate sponsorship arrangements; and the generosity of a community of patrons via our Annual Patronage Program. As a wonderful example of the impact of private philanthropy, Gertrude Glasshouse is generously supported by long-term Gertrude patrons Michael Schwarz and David Clouston. These streams of support mean that while Gertrude Studio Artists are still required to pay rent for their spaces, it is a highly subsisided and affordable level for the facilities provided. What type of exhibitions does Gertrude Glasshouse present? Gertrude Contemporary is a non-commercial, non-institutional contemporary art organisation. This means that artistic freedom for artists presenting in our exhibition program is of absolute importance. We support artists to present risk-taking and ambitious work that they would not otherwise have an opportunity to present in a supportive and resourced environment. As Gertrude Glasshouse is home to the Gertrude Studio Artist solo exhibition program, this means that the exhibitions that we present in the space are as diverse in practice, continuously evolving and exciting as our incredible cohort of local artists participating in our two-year Gertrude Local Studio Artist Program. Unlike an artist-run space, Gertrude does not accept applications to exhibit. Our exhibition program for both Gertrude Contemporary and Gertrude Glasshouse is programmed by our Artistic Director Mark Feary. However, our exhibition program is highly integrated with our two-year Gertrude Local Studio Artist Program which is selected by a competitive application process. The Gertrude Local Studio Artist Program provides 16 large, subsidised, non-residential studios to contemporary artists for two-year tenures. Studio Artists benefit from working within a supported and collegiate environment, and have the opportunity to exhibit their work in the annual Gertrude Studios group exhibition, as well as have an ambitious solo artist exhibition at Gertrude Glasshouse. This program is a highly coveted opportunity and is subject to a rigorous and competitive selection process involving a selection panel of both Gertrude staff and external advisors. Applications open in the last quarter of the year, and there are 8 places available each year. Gertrude promotes all exhibition information via our email subscribers list and social media. We also advertise in Art Forum and work with many media organisations to arrange editorials (art guide, art almanac, the age, artist profile). Mark is responsible for the creative vision, development and management of Gertrude Contemporary’s artistic program. In particular, he develops and oversees an engaging, diverse and critically rigorous studio and exhibition program. He also leads the development of funding opportunities and partnerships to support the artistic program. I am responsible for the for the strategic vision, development and management of Gertrude Contemporary’s business and operational model. In particular, I lead the organisation’s strategic planning and financial management, audience engagement (including communications and education programming), fundraising activities, infrastructure management, and board governance. Siobhan coordinates all our front of house and public facing activities. In particular, she is responsible for the coordination of our Education and Volunteer Programs, supporting deeper audience engagement communications activities, and enabling the smooth running of our organisational activities through administrative activities. Anatol coordinates the implementation of Gertrude’s artistic program, including both the exhibition program and the studio program. In particular, he coordinates exhibition installation, gallery and studio complex maintenance, technical support for events, and studio program day-to-day coordination. Gertrude is a not-for-profit incorporated association and as a result is governed by a voluntary Board of up to ten members. Gertrude’s Board composition is required to include four artists and up to six representatives from the broader public. Gertrude’s work is also supported by a team of incredible and generous volunteers and interns. For me the biggest reward is knowing that my work directly contributes to the organisational sustainability of Gertrude, its support for artists and its impact for the contemporary art sector. Enabling our artists to create and present ambitious and risk-taking work and audiences and education groups to engage with their practice are the two greatest joys of my role. What have you observed to be the greatest changes in the broader visual arts sector over recent years? 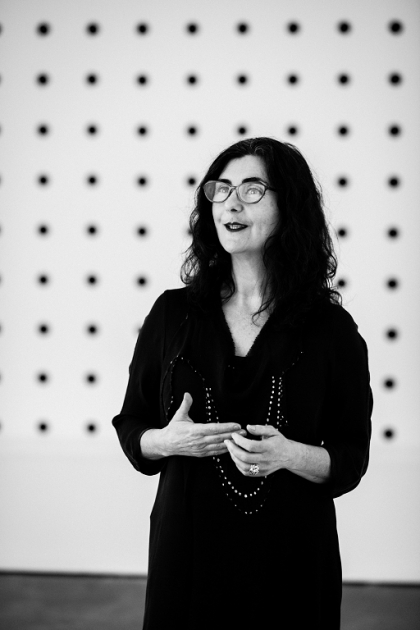 Organisational sustainability has become an increasingly important focus for not-for-profit visual art organisations in the Australian visual art sector due to financial and housing pressures. As one example of this, Gertrude found itself under pressure in facing of the end of its lease of its original building in Fitzroy. Arriving into my position in early 2016, I led the transition of Gertrude to a new custom-designed building in Preston-South which was successfully launched to the public in late July 2017. This move has strengthened the organisation’s sustainability and safeguarded its continued impact within the contemporary art sector. Many other organisations are facing similar challenges. Their work in addressing these challenges will change the shape and nature of the sector. What do you hope for the future of the sector and your organisation? I would like to see the sector build on its strengths in supporting Australian contemporary art practice, artists and audiences and keep working to grow the sector’s sustainability for the benefit of future generations of Australians. For Gertrude, I see a thriving future for the organisation as Australia’s leading incubator of contemporary art. A future that continues to support future generations of Australian artists and audiences in the continuously evolving and impactful way that it has proven in its thirty-year history. SEVENTH Gallery is a space that embraces experimentation, risk and diverse artistic practices. We have a commitment to supporting emerging artists, curators and writers. SEVENTH is run by a democratic board of artists and arts professionals who champion accessibility and affordability for artists and artist-run-initiatives. Our diverse public program of events engages critically with our exhibitions and broader concerns of contemporary art. These programs encourage collaboration with members of the community, as well as providing mentoring and professional development opportunities for artists and curators. SEVENTH continually seeks to engage with the broader arts community to foster collaboration and build creative networks. All positions at SEVENTH are voluntary, except for the Gallery Manager position, which is a part-time position. The gallery is run through the hard work and dedication of the volunteers and the board who passionately believe in supporting emerging artists and their practice. Briefly describe the type of exhibitions that SEVENTH presents. SEVENTH is distinctive for its responsiveness to change and is shaped by the artists of the community it serves. From painting, to performance, installation, text and projection - SEVENTH is defined by the breadth and diversity of practices and contributing artists. To maintain this open responsiveness SEVENTH is run by a board of directors with diverse artistic backgrounds and preferences. Proven involvement and enthusiasm in the contemporary art scene. Our decisions are weighted towards ambitious projects that push boundaries and show substantial conceptual depth.We encourage collaborative dialogue, interaction, performance, workshops and unconventional methodologies. Statistically, artists who identify as female (61%) or non-binary (10%) make up the majority of exhibiting artists, with 67% of exhibiting artists coming from culturally and linguistically diverse backgrounds. SEVENTH attracts over 15,000 visitors per annum, with this number dramatically increasing over the last two years due to the expansion of our role in the artistic community. With some project based support from government funding, SEVENTH has also been able to create links with other not-profit spaces, and work together to present critical and engaging exhibitions, public programmes and create a dialogue with the broader community. 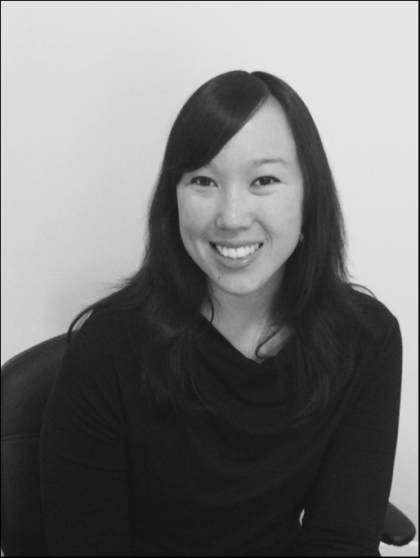 Our Media Strategist Leela Schauble assists in creating and distributing exhibition content through various channels, particularly through online formats, including our social media pages and website. SEVENTH attracts creative, intelligent, culturally interested and socially aware people of varying ages and from a diverse range of occupations. Its supporters and patrons are the influential leaders of now and the future, members of the local community, curious passers-by and newcomers to the arts. How did you become a board member of SEVENTH? Briefly describe your career path up to this point. I have recently come on board with the SEVENTH team as Gallery Manager, alongside Anita Spooner, after applying for the role. Previously I had been working in commercial and university gallery spaces and was eager to bring my administrative and curatorial skills to an environment that facilitates experimental practice and supports emerging artists. My career in the arts began developing events to engage students with the arts at the Lawrence Wilson Art Gallery, located at the University of Western Australia. Here, I realised how rich and rewarding a career in the arts could be - so I left my law degree to pursue studies in the arts. Moving to Melbourne, I have been able to learn from a generous and rich community of artists and arts workers, in both volunteer and paid roles. Although much of my role takes the form of administrative duties, bringing together artists and members of the community through exhibitions and public programs is the most rewarding aspect of my role. I am constantly learning so much from the community that has developed around SEVENTH, from members of the Board, exhibiting artists and the community members that participate in exhibitions, public programs, or artist talks, and I am grateful to be able to contribute to such a rich environment. While SEVENTH accepts proposals from both national and international artists, over 95% of our applicants and selected artists come from Victoria, mostly from Melbourne. 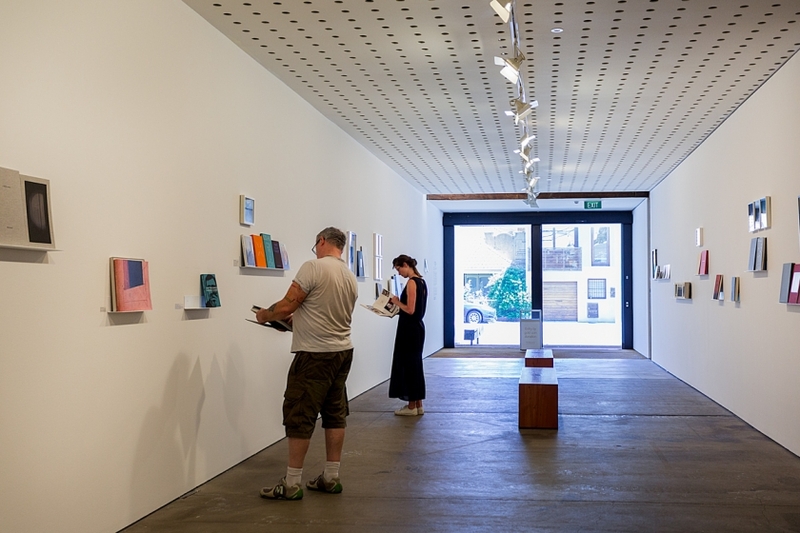 SEVENTH is a key organisation for new and emerging practices in the Victorian contemporary visual arts community. It is essential that young and emerging artists have a place to exhibit their work and develop their professional careers, and we offer them the opportunity to exhibit their work to a large and diverse audience. SEVENTH is an important cog a network of creative spaces, physically allowing the works of emerging artists to exist in dialogue with contemporary art by established artists. As a member of All Conference, a national organizing network, comprised of 15 artist-led, experimental and cross-disciplinary arts organisations, SEVENTH contributes to a collective voice that celebrates and champions the richness of artist-led and experimental spaces, local engagements and broader national and international engagements. 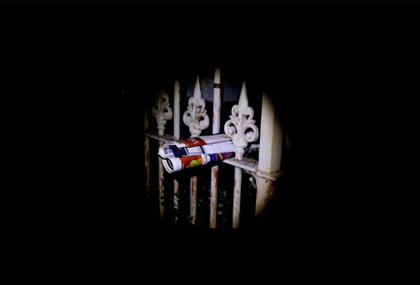 SEVENTH has a broad target audience, from emerging and practising artists, writers and arts professionals; the population of the City of Yarra, to interstate and international artists. SEVENTH is primarily a volunteer-run organisation. As well as the volunteer-run Board, SEVENTH has approximately 35 volunteers who assist the artists in sitting the gallery, and during public programs, openings and other events. Volunteering with SEVENTH allows volunteers to gain insight into the operations of an ARI, whilst engaging with artists and their practices. Our volunteer pool broadens our community networks, and provides future arts workers with the opportunity to learn and grow in a supportive environment. Maintaining a long term, sustainable funding and operations model is the main challenge that SEVENTH has faced - and continues to manage. Establishing a long term funding model that not only allows for project funding, maintenance and general operations - but also fair and equitable remuneration for emerging and practising artists in the contemporary arts climate is high on SEVENTH’s agenda over the coming years. SEVENTH has rightly observed calls for increased diversity and representation in the visual arts sector, alongside shifts toward increasingly cross-disciplinary practices. In terms of the local arts ecology, this has spurred conversations around access, visibility, labour and representation. 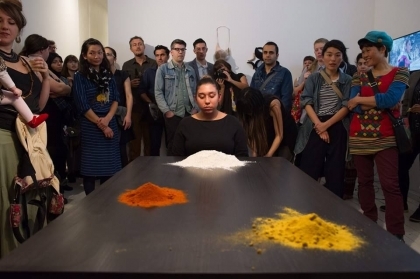 Reflecting upon exhibition practices, internal structures and broader modes of engagement has provided SEVENTH with a foundation from which to engage further with artists from diverse backgrounds and diverse communities. Having the time and resources to analyse data from exhibiting artists has provided a measure against which diversity and diverse practices can be considered - alongside consultation with communities and subsequent reflections on SEVENTH’s organisational and operational structures. Adaptation to these broader changes is ongoing, multi-faced and malleable. SEVENTH is always seeking new funding avenues to facilitate special projects and engage new audiences - particularly with a focus on increasing diversity and access. In addition, SEVENTH is developing into an organisation that can support and expand cross-disciplinary arts practice in meaningful ways. We are responsive and flexible to a range of artists and disciplines, with experimental practices facilitated through performance, workshops and public programs. SEVENTH aims to grow into a sustainable organisation that demands less of artists financially and allows more time for conceptual engagement with works. We also look to a future that provides resources for educational programs through the gallery. We want the future to be about dynamic practice and challenging art. For the visual arts sector, we hope for a lively, competitive and supportive ARI community that has strong and continued support from the community and the government. In regards to SEVENTH, we hope to continue to support the Victorian emerging contemporary art community through sustainable, engaging and meaningful facilities. Melbourne has a strong collection of artist-run initiatives and SEVENTH was one of the first of these organisations to open. Could you explain the context that has given rise to these initiatives? ARI’s not only provide artists with the space to exhibit, experiment and explore their practices, but also locations to develop networks, communities and connect with their peers. These strong communities grow from a need to enrich arts environments outside of traditional gallery models, and a need to nurture emerging practices through the development of arts communities. Melbourne is fortunate to have a strong, supportive network of ARI’s presenting diverse practices, however, this is part of a broader national narrative from Alice Springs to Perth. In recognising the significance of ARI’s, SEVENTH is a proud member of All Conference, a national organising network comprised of 15 artist-led, experimental and cross-disciplinary arts organisations, bridging geographical distance to create a sense of togetherness and solidarity across the country, sharing knowledge and support. Describe the nature of your organisation as a commercial enterprise? How does it continue to operate successfully? 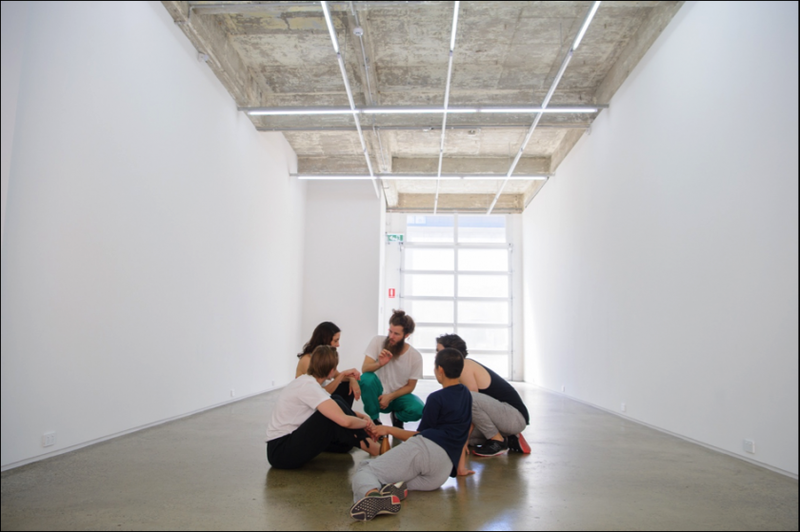 We are two galleries that share a physical gallery space and collaborate on domestic and international projects. We jointly look after our represented artists, we feel this collaboration allows for greater flexibility, innovation and extension of resources. The physical gallery space acts as our base and gives us presence in Melbourne but we are very focussed on taking our artists overseas to exhibit in art fairs and other international projects. Briefly describe the type of exhibitions that dianne tanzer gallery + THIS IS NO FANTASY presents? We show a diverse range of art including painting, photography, sculpture and glass. We represent a range of emerging to mid career contemporary Australian artists, we show these artists in our gallery space, at international art fairs and other offsite projects. We have a staple of represented artists that we have worked with for many years, It is vital that we look after these more established artists. In saying that we also spend a lot of time developing relationships and curating new and emerging artists into our shows, this usually happens quite organically. Our main promotional tool is our website. We also send out email campaigns to our client base, advertise in art magazines and update our Facebook and Instragram regularly. Participating in art fairs helps us to build and develop relationships with new audiences. There is always an amazing amount of work to do, especially in the lead up to an art fair. 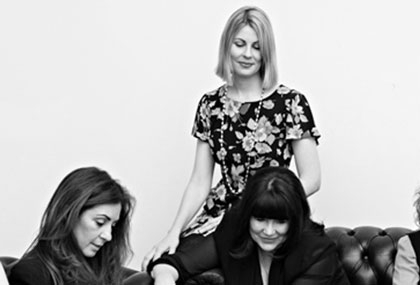 There is Dianne Tanzer, Nicola Stein and Jemma Clark, Lucy Hughes and Brit Salt. We all work across most aspects of running the gallery with each of us bringing a different expertise. How did you become the Director of Dianne Tanzer Gallery? Could you briefly describe your career up to this point? I have always understood the fragility of life and the ephemeral nature of things, so I've gravitated to occupations and interests, that I feel will have longevity, and hopefully a significance that may well last into the future. Before I had a gallery had a medical background which I loved also. Working with a vast range of artists and seeing their ideas fruition into amazing projects. It is always really rewarding to see our artists achieve and have their work recognised. How do you see your organisation’s contribution to the Visual Arts sector within the local context of Fitzroy? Australia? Globally? We love having our gallery at the centre of Melbourne's art scene. Fitzroy and Collingwood have an amazing array of galleries and these areas really have grown into a art and culture destination. Each gallery in the area is run differently and has varying focuses so it is really nice to have that diversity. Having a gallery space in Fitzroy has enabled us to showcase local and international talent and help develop and build artist careers. The traditional notion of an art gallery has dramatically changed over recent years. A physical gallery showroom is no longer necessary to exhibit art. The majority of clients buy online or see the work at art fairs or pop up exhibitions. The art sector is becoming a lot less rigid and confined to the idea of a physical gallery space. We hope to continue to be a means of encouragement and support for Australian artists. We would like to see a broader audience interested in local artists and hope to encourage this by creating accessible and easily approachable shows. These resources have been developed to offer VCE Studio Arts students and their teachers real-life insights into the ways art industry professionals collaborate with contemporary artists at CCP to prepare for and present exhibitions. An aspiring artist who intends to exhibit their work publicly will engage with the art industry at various stages as their career evolves. Every exhibition of a living artist’s work is the result of a considered process undertaken by artists and art industry professionals who work with them to bring their artwork into the public sphere. Student and Teacher, Gallery Director, Curator and Artist. Create your own artwork by carefully observing and recording the details of your neighbourhood or your daily journey to and from school using any lens based media. 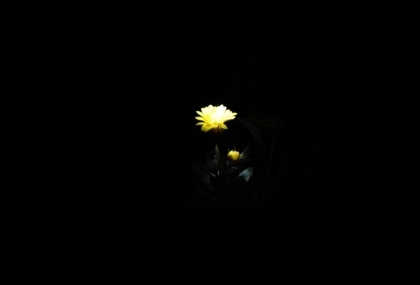 You might try different times of day or night, playing with the change in natural light. You might also choose to focus on small incidental details rather than the full scene. Select and edit your collection of images to produce a finished artwork about your experience. For instance, you may produce a time-based artwork like Charlie Sofo or you may produce a sequence of still images. Consider how to you might present your artwork in a class exhibition. 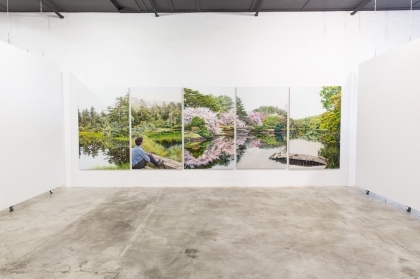 Installation view: Parklife, CCP, 2010. 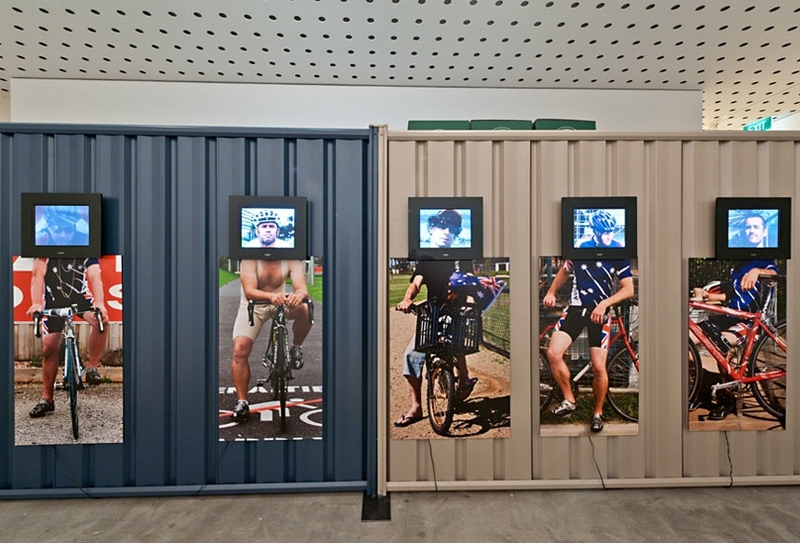 Installation view: Anonymity, CCP, 2011. Installation view: Black White & Grey. Photographic Studies (Photosheets), CCP, 2012. Installation view: CCP Colour Factory Award, CCP, 2009. Installation view: Autumn Masterpieces: Highlights From the Permanent Collection, CCP, 2010. 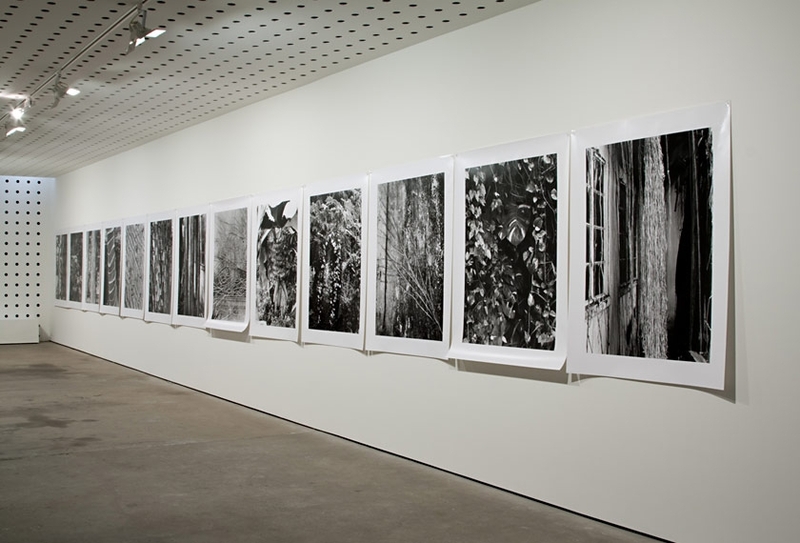 Installation view: Kodak Salon, CCP, 2010. 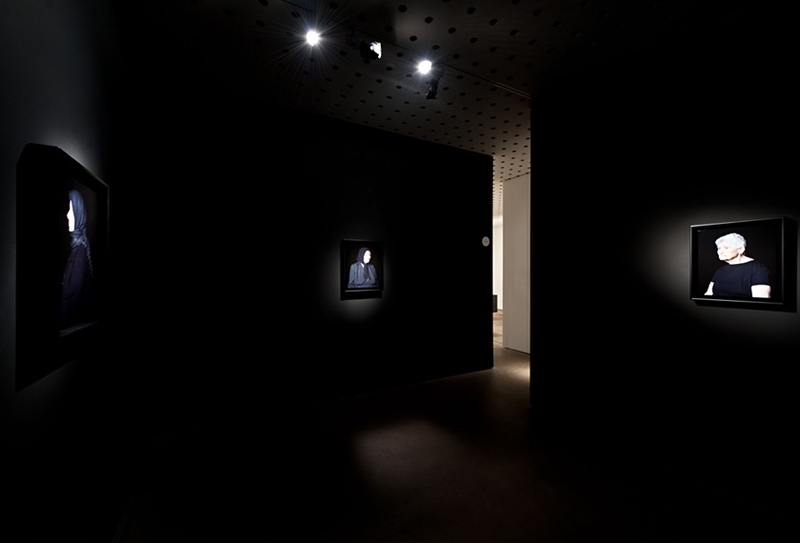 Installation view: The Mourners, CCP, 2011. 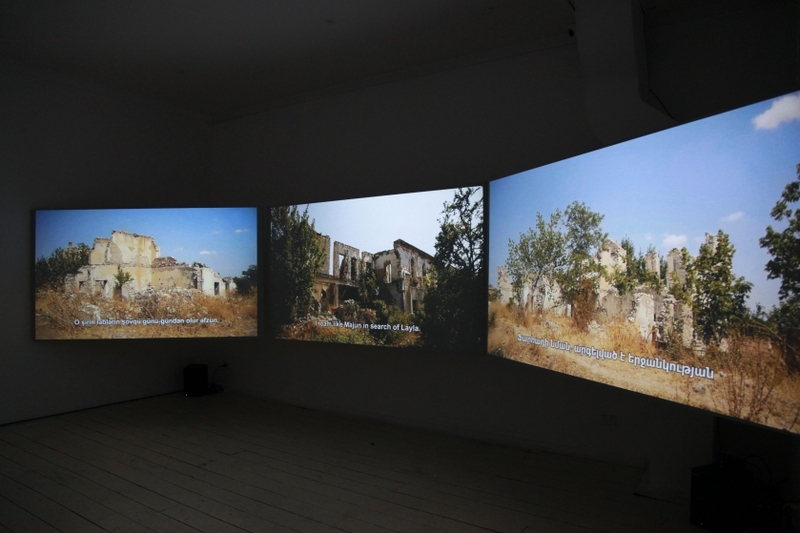 Installation view: Lost and Found, CCP, 2012. 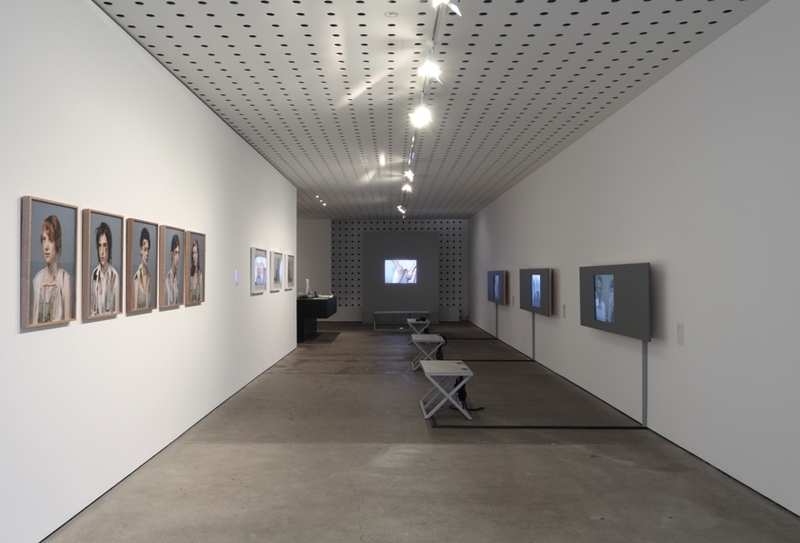 Installation view: True Self: David Rosetzky Selected Works, CCP, 2011. Many variables influence the design of an exhibition such as the rationale of the work; the scale of the gallery space; the budget; time available to install the exhibition; safety and security issues and the audience. Exhibitions presented at CCP are varied and can include visual and/or sound installations, two and/or three dimensional artwork, time-based artworks, work drawn, painted or projected onto walls, and performance. The placement of artworks can have an impact on the way audiences view them. A carefully considered arrangement of artworks encourages the viewer to make conceptual leaps between works of art and to create a sense of visual prominence for key works. The process of transforming bare white walls into an exhibition environment prompts a thorough consideration of the potential relationships between individual pieces. Devices such as the colour of the walls, style of lighting and methods for hanging artworks all contribute to the appearance and mood of an exhibition. Some exhibitions are actually devised by artists as a series of components that are then transported and assembled for the first time on site at the gallery. 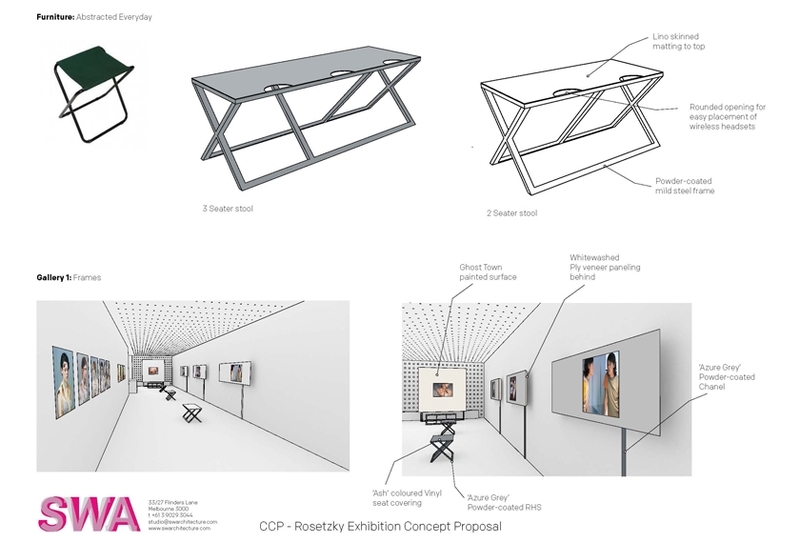 Exhibiting artists and/or curators are responsible for the overall design and layout of exhibitions at CCP. In this role they act as mediators between the artworks and the viewer. Presented as a visual sea of images each picture is displayed in close proximity to the next. The images are the collected remnants of family photographs recovered from the devastation following the tsunami in Japan in 2011. While visually effective, this exhibition is highly unusual for CCP as it is not the work of contemporary photographic artists. 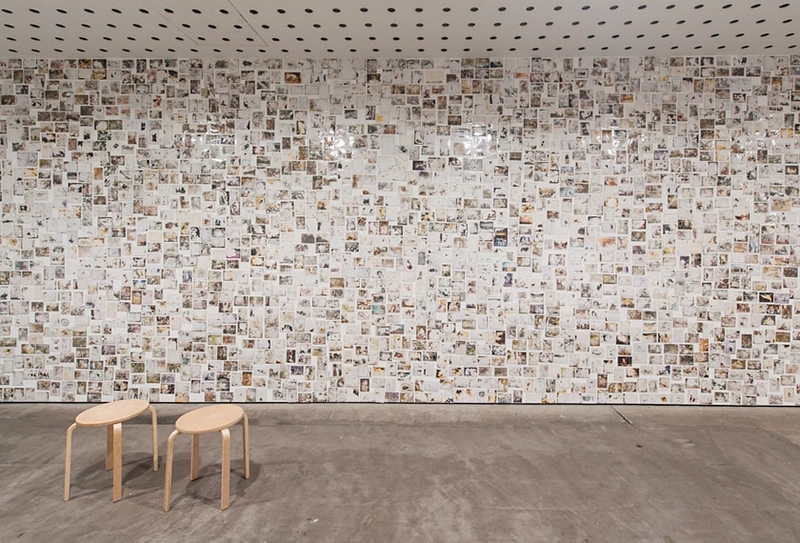 By presenting these damaged family photographs together in this way, the viewer is given an opportunity to reflect upon the scale of the disaster and the profound impact of this event on families in Japan. Due to the fragile nature of these photographs and their memorial significance, each photograph was placed in a clear Mylar sleeve and archival Blu Tack used to attach them to the gallery wall. For this exhibition John Nixon used cream-coloured foolscap manila folders as a framing device for his photographs. 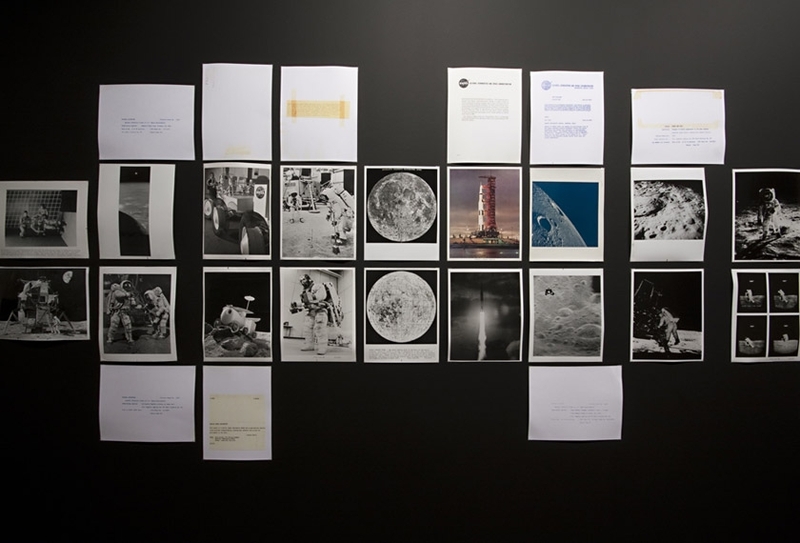 By using business stationery, traditionally used for filing documents, as a format to organise and present the artwork, Nixon emphasises the manual ‘cut and paste’ method he used to lay out and group his images. Pinning folders to the gallery wall was a very efficient way for the artist to install and de-install the exhibition. This work consisted of 12 cardboard light-boxes, each containing a single portrait, stacked together and installed in a corner of the gallery. For this series, individuals posed holding a circular mirror in front of their faces, reflecting the blinding glare of the sun directly into the camera lens. The heads of these subjects disappear in reflected light so that their clothes and the objects that surround them become the only signs of their identity. 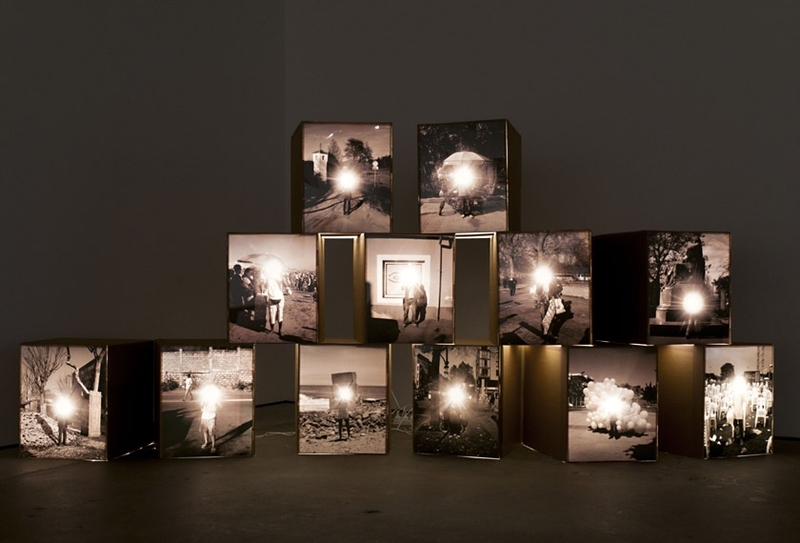 The light-boxes emphasised the extraordinary play of light within the images. They were complex to install due to the numerous electrical connections that needed to be hidden from view. For more exhibition examples, visit the CCP website. 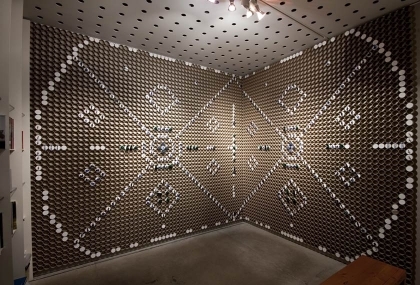 Architect Simon Whibley was invited to solve a particular problem faced by CCP and many galleries in exhibiting multiple video works that include sound, for display in one sonic (sound) space. Sound bleed is one of the hurdles in presenting multiple video works. A further challenge for the architect was to solve this in a manner consistent with the artist's highly refined aesthetic. The architect was also constrained by time and budget. Simon Whibley's specific commission was to create a series of small spatial environments, namely exhibition furniture, that could house video works and seating for viewers to watch time based works. The design brief encompassed practical aspects, such as concealing technology and framing different screen ratios of video artworks, but also aesthetic considerations around creating a unified viewing space that could assist and enhance people’s engagement with the artworks. Another facet of the project involved finding the best way to support the presentation of the artworks across a range of diverse touring venues across regional Australia, because each venue will present completely different viewing conditions. The project required great sensitivity in order to avoid inserting an architectural dialogue into Rosetzky’s exhibition. Rosetzky’s artwork Think of Yourself as Plural was the starting point for developing the design concepts. Colours and fabrics in this work provided a basis for the colour palette and junctions between the various textures and materials- plywood, paint and linoleum. Rosetzky’s composition of everyday objects also became a source of inspiration for the architect. For example, the seating is based on camping seats- a re-design and re-purposing of something well known rather than the invention of something new. Another aspect of the exhibition design involved considering how each of the exhibition elements could be easily assembled, disassembled, packed and freighted to different locations. The architect collaborated closely with the organisation National Exhibitions Touring Support (NETS), CCP curators, the fabricator and the CCP installation crew to work out how each component fitted together and how they could be tough enough to withstand two years of moving around Australia. Handling artwork during the installation of Kodak Salon, CCP, 2011. Kodak Salon entries stored on padded chochs waiting to be installed, CCP, 2011. 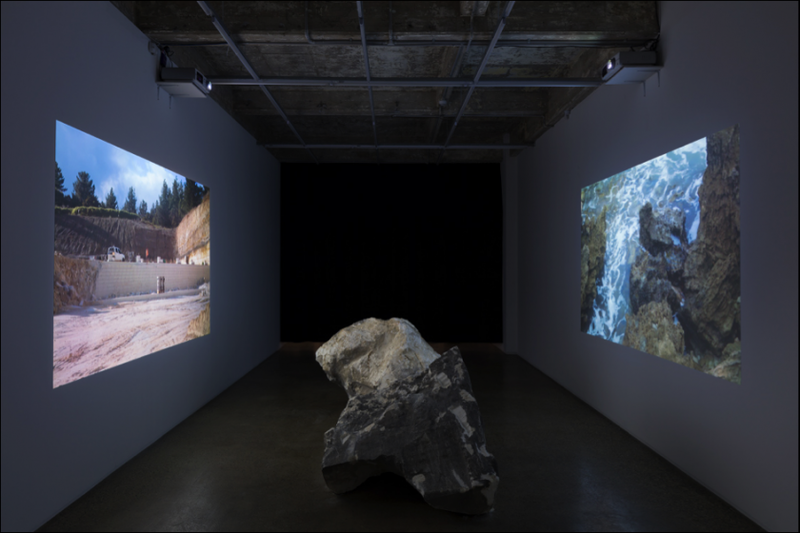 Installation view: Inland, CCP, 2009. Artworks are pinned directly to the gallery wall. 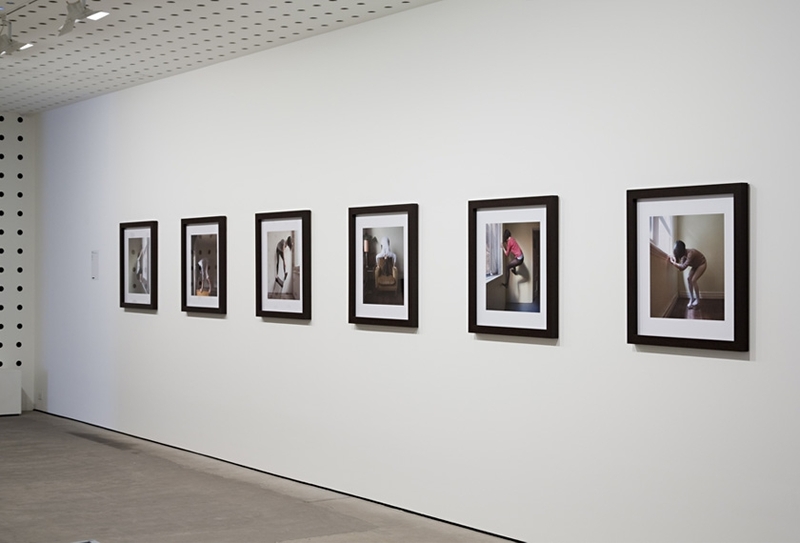 Installation view: CCP Documentary Photography Award, CCP, 2011. Artworks are framed in the traditional manner. Installation view: This Weather, CCP, 2011. 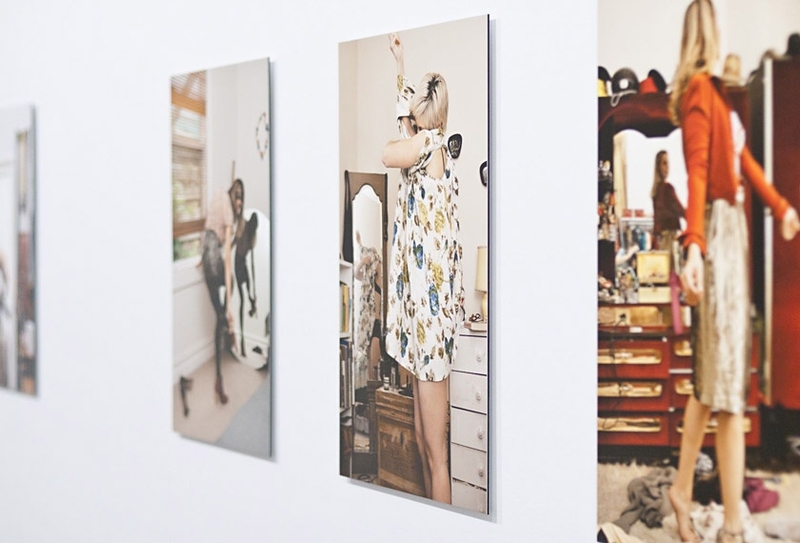 Artworks are pinned directly to the wall. 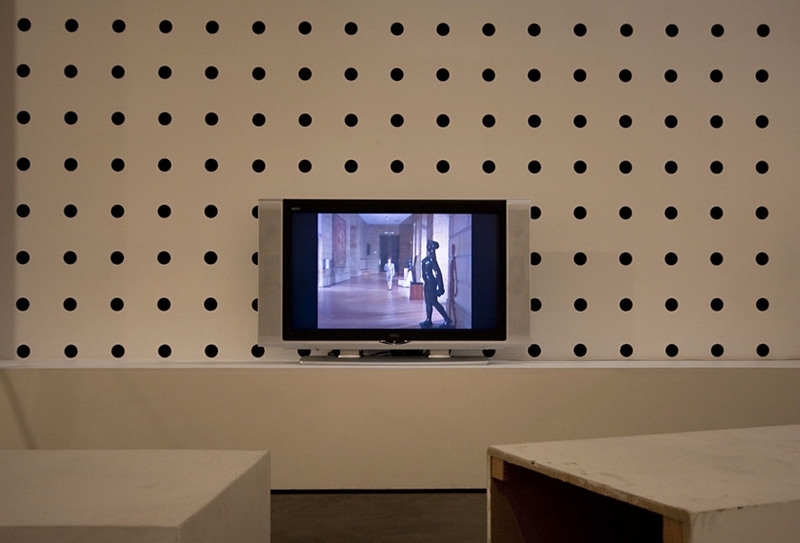 Installation view: La Toilette D'Une Femme, CCP, 2011. 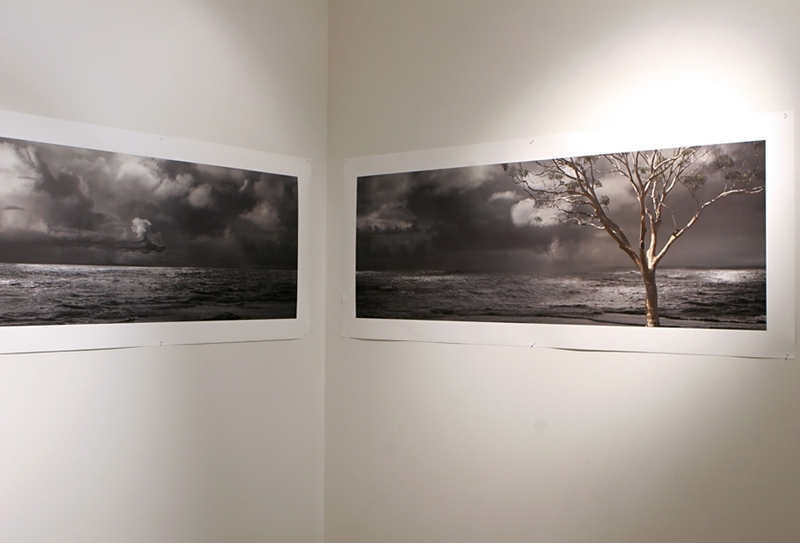 Photographic prints are mounted on diabond. 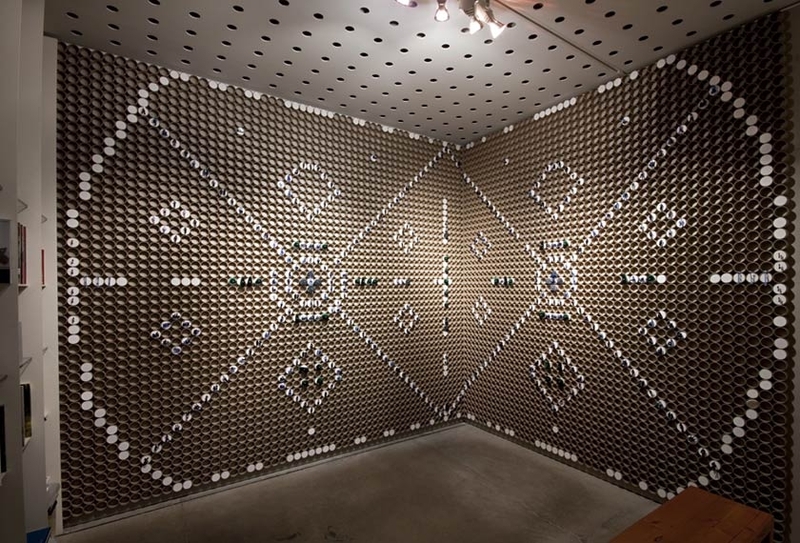 Installation view: Event Horizon, CCP, 2010. Artworks are pinned directly to the gallery wall. Materials – A specialist knowledge of the particular materials in an artwork and a concern for the decay of these types of materials over time. Ethics – An acknowledgement and respect for the integrity of the artwork, and keeping true to the artist’s intentions for the display of that artwork. 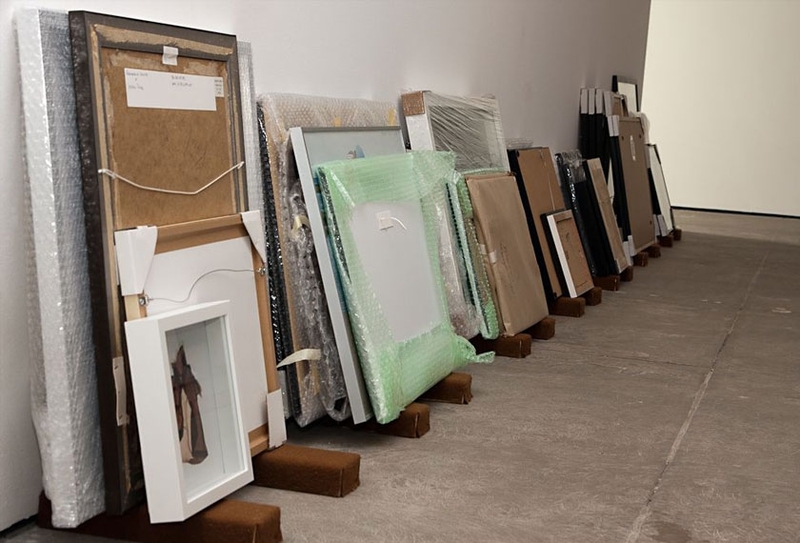 As contemporary art can involve experimental materials that are fragile or ephemeral, curators need to be able to select and apply a range of different measures when they are storing and handling, presenting, and lighting artworks for an exhibition. Ironically the most effective way to maintain the life of an artwork is to minimise its handling, and store it in the dark, under optimum environmental conditions. However, a balance is naturally required between conservation and public access. Major public galleries such as the NGV employ museum-standard environmental conditions, storage and handling procedures to prevent and reduce damage, and to restore, their collection. Temperature and humidity – A climate control system regulates the temperature and moisture levels in the air, reducing the expansion and contraction of materials within artworks over time. An ideal temperature range for storing artworks is between 18 and 22 degrees Celsius. Lighting levels – Exposure to strong light will deteriorate most artworks. The level of light used for works on paper is usually 50-150 Lux, with 200 Lux for oil paintings. Storage – When artworks are not on display they are held in storage, generally according to museum standards. For instance, works on paper are stored flat, between archival grade tissue paper, in pH neutral, light-, dust- and pest-proof solander boxes. Invigilation – Museums employ guards or invigilators to monitor visitors and to ensure that they do not touch works of art. Touching can transfer invisible oils onto the artwork and can cause chemical damage. Often valuable artworks are displayed behind glass for protection. 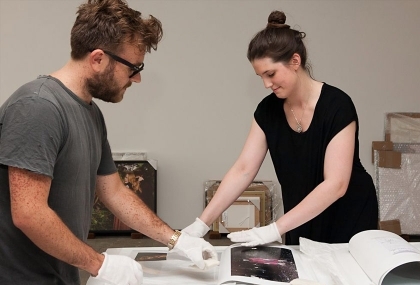 Handling – Gallery staff who handle artworks wear white gloves and handle each individual artwork with a great deal of care. Remedial conservation and restoration work – Highly trained specialist conservators can treat an artwork if it is damaged or is deteriorating significantly. Cleaning is the most common treatment. A challenging and relatively new area of conservation and storage concerns the highly popular time-based art form – video. Video presents challenges as technology changes rapidly and original equipment can often not be maintained in working order over time. Institutions all over the world are looking at solutions for this vexing issue, often preferring to migrate work to digital formats. Museums are working in consultation with living artists to ensure that their intentions are understood well into the future. For example, some artists might prefer their work to become obsolete. For more information on conservation and preservation, visit a discussion paper on the Tate Museum’s website. The CCP only maintains a temporary (as opposed to permanent) collection and cares for artworks for the period of time that they are being handled and are on display. At the CCP, artwork is exhibited for around eight weeks. The CCP does not have a space to store artwork on-site prior to or after exhibition, and short exhibitions do not need museum-standard climate controls. Artwork conservation at the CCP begins with a preliminary discussion between the curator and the exhibiting artist about the nature of the artwork and their ideas on presenting the artwork. Curators offer advice to the artist, but do not advocate traditional conservation practices unless they align with the artist’s intention. Unlike museums in the contemporary art world, communicating the meaning of the work for the time it is on display is more important than the longevity of the work. The museum standard for presenting photography is to mount the print on acid-free board and then frame it behind glass. It is important to understand that how an artist displays their work is part of the meaning of the work. Pinning work directly to the wall is often preferred for aesthetic reasons, as it emphasises the ‘object-ness’ of the photograph—the viewer can appreciate the paper stock and its weight, providing a more direct experience. Contemporary artists exhibiting at the CCP regularly opt to pin their artworks directly to the gallery wall. This simple technique puts a small hole into the corners of the print and can result in the print warping and buckling over time. This can be minimised when the corners are reinforced underneath. A popular method for mounting large prints is to bond them to an aluminium composite material known as diabond. This commercial process ensures artwork remains flat while on display, but is not good for conservation as it produces a non-reversible bond to a relatively unstable compound. Occasionally unorthodox materials are used to attach artwork to the gallery walls. In the case of the exhibition Lost and Found an archival Blu Tack and clear Mylar sleeves were used. 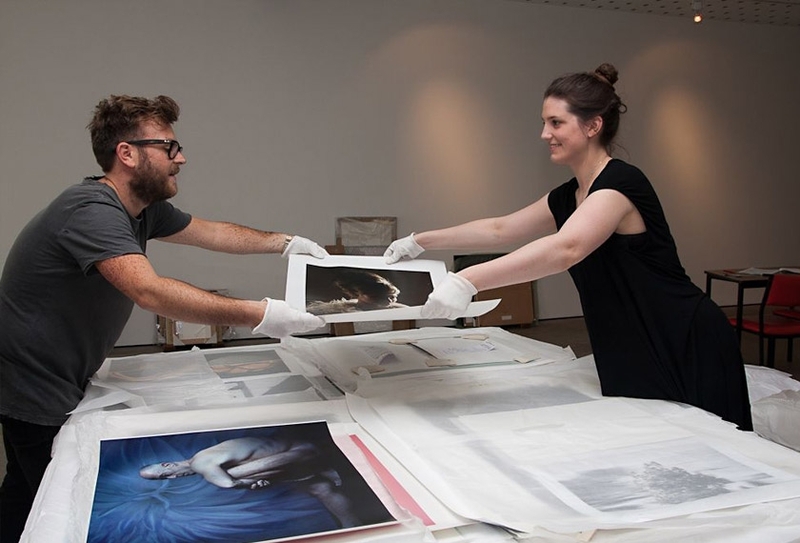 All artworks at the CCP are handled using museum standards, including use of white gloves at all times when moving artworks and following artists’ and curators’ instructions about lifting and installing individual pieces. Artworks borrowed from other galleries arrive and leave with a detailed condition report prepared by the curator. When moving an un-framed or un-mounted print, it is preferable to roll the work and carry the roll underneath with gloved hands, or in a tube. If the work is large and unrolled, two people must lift it from two alternate corners, on the diagonal. If a print bends or cockles (wrinkles), this cannot be reversed or repaired. For this reason, many photographic artists have an ‘exhibition set’ of prints, separate to the ‘edition set’, which can be replaced when damaged. Prints that have travelled (rolled) in a tube must be ‘relaxed’ before being installed; this can be done by placing the artwork on a clean, flat surface to unroll naturally, or by having small, soft weights placed on each corner to encourage flatness. Occasionally a print will be pinned to the wall at the two top corners and left overnight to unfurl before being pinned at the bottom. 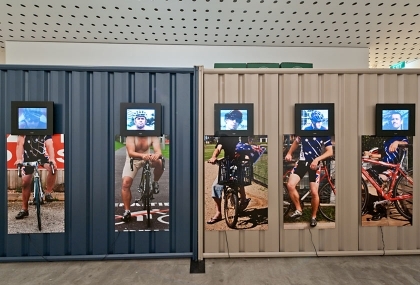 Installation view: Australia Days, CCP, 2011. Opening night: Black White & Grey. Photographic Studies (Photosheets), CCP, 2012. Installation view: Installed in the Midst of the Visible, CCP, 2011. 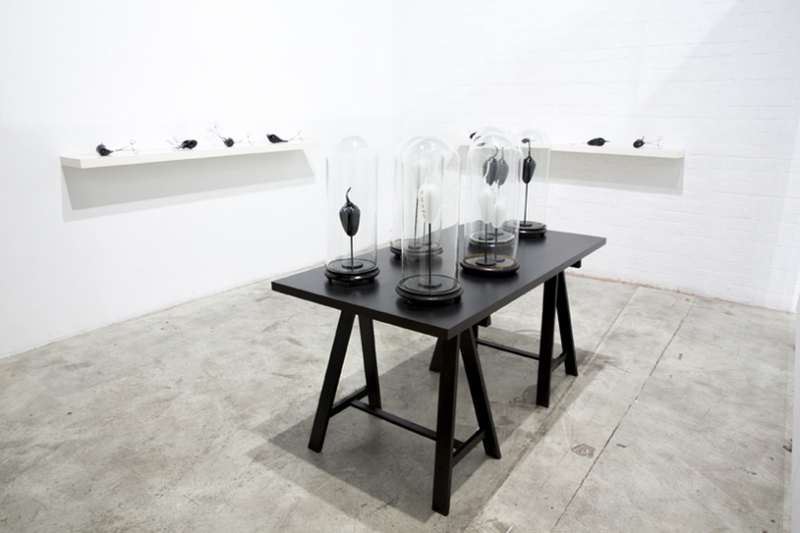 Installation view: Without Words, CCP, 2011. 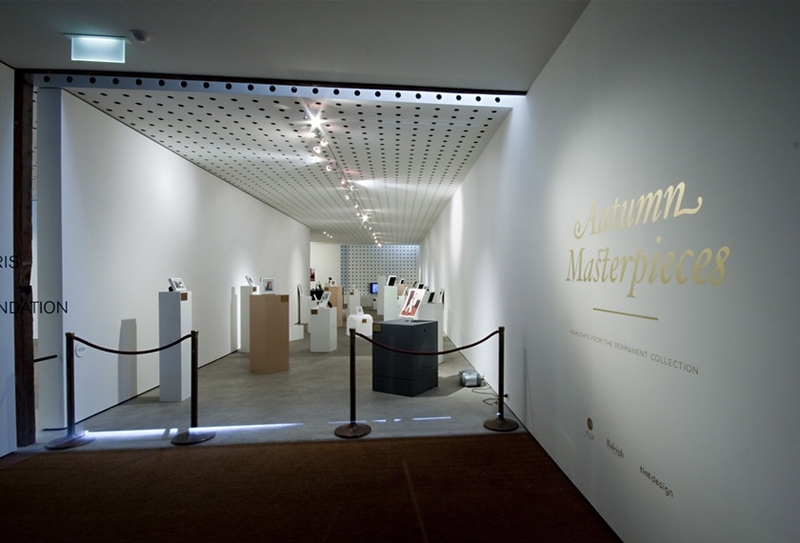 Installation view: Autumn Masterpieces, CCP, 2010. Developing an art exhibition involves a series of considered selections by artists and gallery staff. This process begins when the artist prepares an exhibition proposal or comes to the attention of an art industry professional such as a curator. Contemporary art spaces achieve a critical role in the ‘ecology’ of the visual arts, through creating an opportunity for the presentation of new, challenging or experimental ideas. Selecting which artists will exhibit at a contemporary art gallery such as CCP is an intensive process. It often requires consideration to the formation and selection of ideas that artists and curators believe will make a lasting contribution to Australian culture. At CCP, an advisory panel of up to eight experts discusses, argues and selects what the gallery will exhibit. The advisory panel aims to choose artists who will make a lasting impression on audiences as well as making a tangible contribution to the area of contemporary photomedia. Once selected, an artist will usually visit the gallery to measure the space/s they have been assigned. They then prepare their artwork with the architecture of the gallery space in mind. Artists and curators consider the space as a total environment, integral to the meaning and effectiveness of the exhibition. Artists may therefore alter the existing architecture of the gallery. For instance they may cut a hole in the floor or wall, install carpet or paint the walls. Curated exhibitions such as Kyla McFarlane’s Without Words (2011) , Mark Feary’s Event Horizon (2010) and Naomi Cass's In camera and in public (2011). These are initiated and developed by the CCP curators to explore particular themes or ideas. Curators determine the artworks they would like to group together and negotiate with artists, owners and commercial galleries to borrow the works. They work within a budget to design the exhibition and possibly alter the gallery space to present the artworks. They usually write a catalogue essay about the central ideas within the exhibition. Proposal exhibitions such as Sharon Billinge’s Installed in the Midst of the Visible and Sarah Ryan’s The Fourth Dimension (both 2011). These exhibitions arise from a successful proposal to the gallery. Artists are responsible for installing and de-installing the exhibition. If an artist paints or alters the environment for their exhibition, they are required to undertake restoration afterwards. 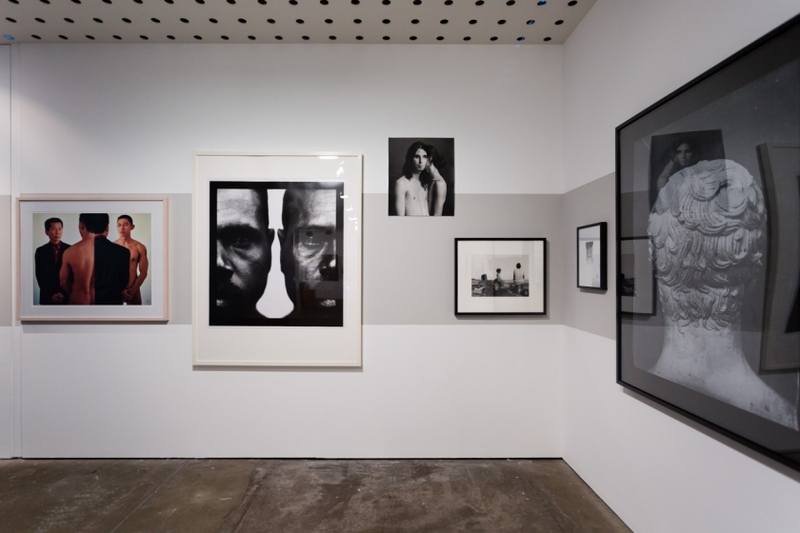 Solo exhibitions such as Georgia Metaxas’s The Mourners (2011) and John Nixon’s Black White and Grey: Photographic Studies (Photosheets) (2012). These exhibitions are presented by a single artist. 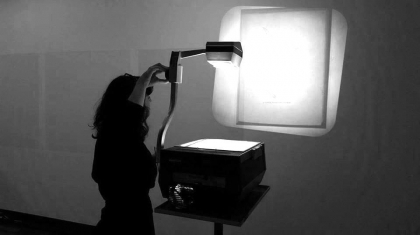 Group exhibitions such as Photocopier (2010) are exhibitions presented by several artists who wish to share the gallery environment and collaborate on an exhibition. Award exhibitions such as the CCP Documentary Photography Award. Photographers submit their work for inclusion in the exhibition and are selected by eminent judges from the photographic and arts community. The judges also select an overall winner. 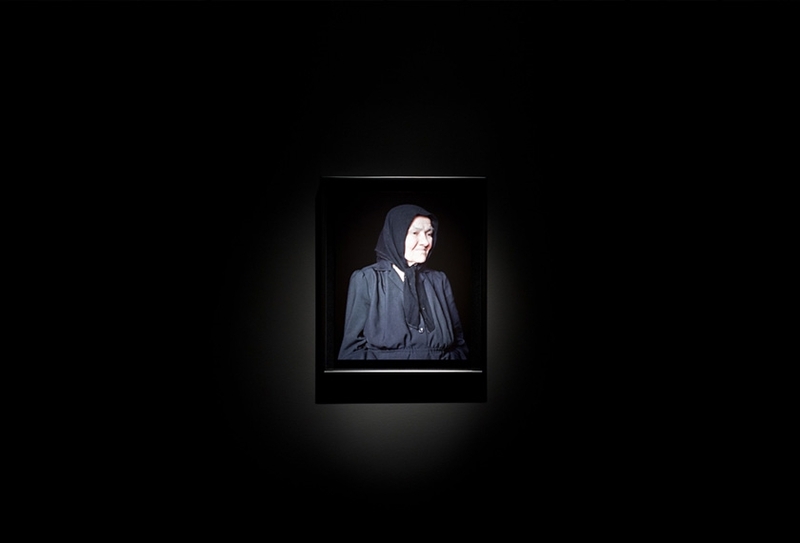 Touring exhibitions such as Taryn Simon’s An American Index of the Hidden and Unfamiliar (2010). These exhibitions travel to and from other Australian and international galleries. 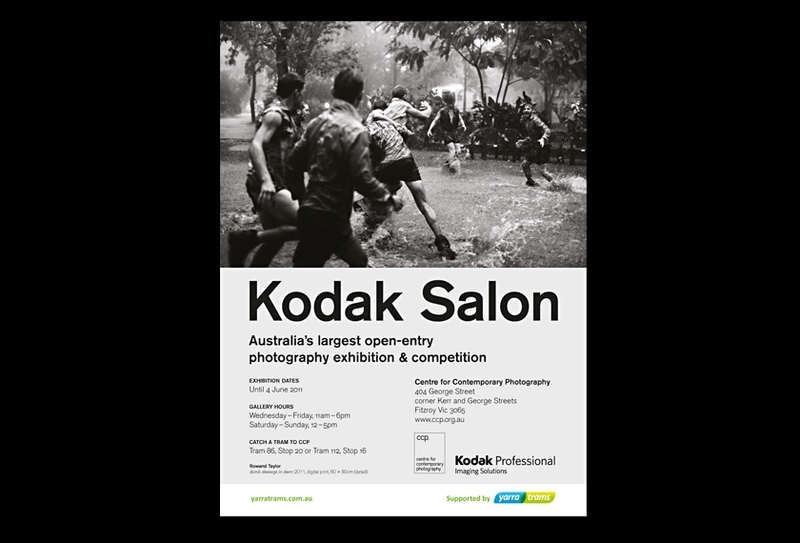 Community engagement exhibitions such as Kodak Salon. This annual event at the CCP is sponsored by Kodak. It offers the professional photographic community, students and enthusiasts the opportunity to exhibit their work at CCP. There are usually around 400 photographs on display during this popular exhibition. Fundraising exhibitions such as Limited Edition Print (LEP). Each year an established and highly regarded photographic artist such as Bill Henson or Patricia Piccinini generously offers to donate ten copies of one of their artworks to CCP as its major fundraiser. The prints are offered for sale to CCP patrons and art collectors. To view more past exhibition examples, visit the CCP website. Kodak Salon 2011 Promotional Poster. 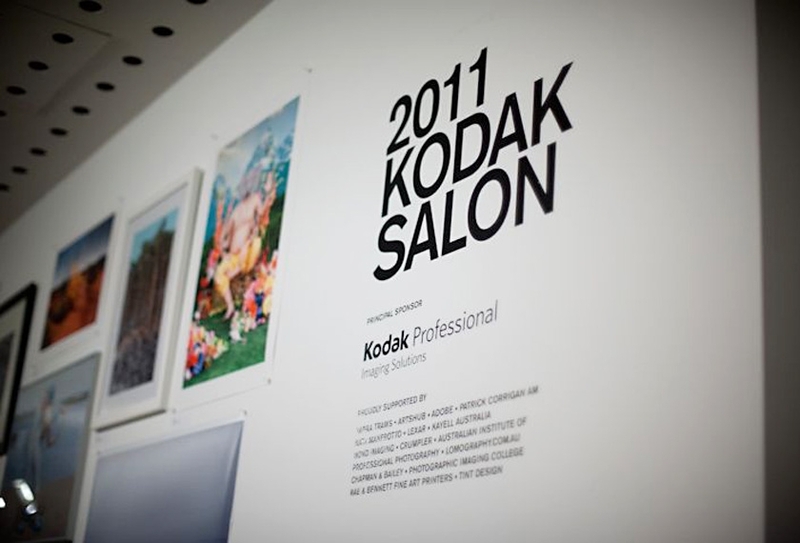 Kodak Salon 2011 Wall Text. 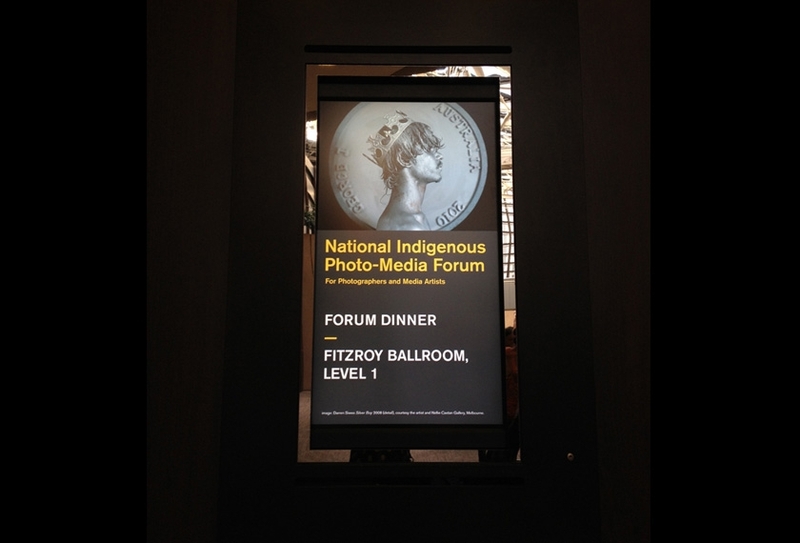 National Indigenous Photo-Media Forum Lightbox Display. 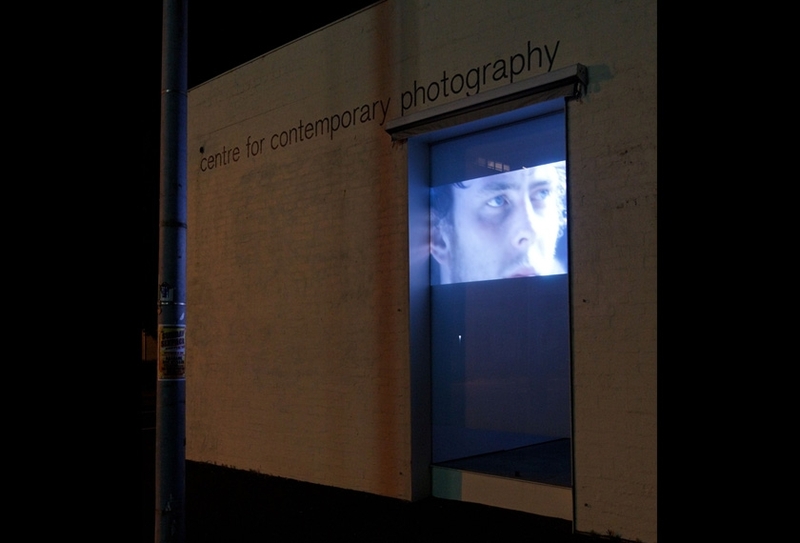 Exterior view: Night Projection Window, Centre for Contemporary Photography. 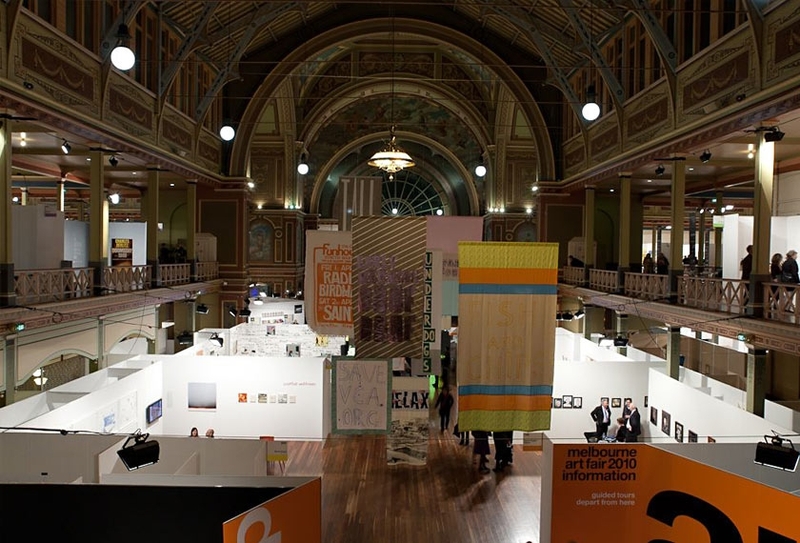 Installation view: Melbourne Art Fair, Royal Exhibition Building, 2010. Promoting and marketing are useful ways for an arts organisation to establish, maintain and build a public profile. As a not-for-profit organisation, CCP has a modest marketing budget for public engagement. Their marketing strategies are designed to connect with the public in order to inspire them to see an exhibition, enrol for an education program, attend an event or even participate as a volunteer, member, patron or exhibiting artist. Their most effective form of marketing is word-of-mouth or social media, arising from a great exhibition, lecture, workshop or public program. CCP’s only regular advertising is listings in the Art Guide and Art Almanac and sometimes in the online community site ArtsHub. CCP’s curators strive to generate free publicity for the gallery through press releases to newspapers. Print media is invaluable for the gallery in reaching a broader audience. Free publicity often arises when CCP exhibitions are affiliated with large festivals such as Next Wave and the Melbourne Festival, or when CCP participates in off-site events such as the Melbourne Art Fair. A further form of free publicity is granted to CCP on application, when Yarra Trams promote CCP’s Kodak Salon through in-tram promotional posters. CCP has about 8,000 email subscribers who receive invitations to exhibitions openings. CCP has also created an online presence on Facebook with approximately 5,500 members. This has been a successful way for the gallery to connect with people both local and abroad. One effective tactic has been to ask our Facebook members to tag people in an opening night photograph. These photographs provide attendees at these events with a record of themselves and their friends that can be shared, and which is conducive to viral promotion. ‘Like’ CCP’s Facebook page now. Twitter is another form of social media being used to promote CCP, with tweets such as ‘Don’t miss this Saturday’s artists talks’ used to generate interest. Follow CCP on twitter now. CCP employs an in-house graphic designer who ensures that all forms of marketing and promotion undertaken at the CCP are professional, clear and effective. CCP’s graphic identity is carefully considered and maintained. CCP’s Night Projection Window, while presenting one of the country’s longest standing and effective night projection screens for contemporary art, is also an effective way of promoting CCP to a broader audience. Every night, a temporary video artwork or slide show can be viewed on CCP’s George Street window, giving locals and visitors to the Fitzroy precinct a taste of what they may see if they come inside the gallery during opening hours. CCP operates with a small team of committed professional staff who work together to: deliver a varied exhibition program; promote CCP events and programs; apply for sponsorship; report about CCP operations; work within budgets; and develop partnerships with patrons and donors. Sometimes working in a small arts organisation requires undertaking odd tasks that would be unheard-of in a larger organisation with highly specialised roles, and much of the work is collaborative in nature. The definitions below give a broad understanding of the various roles and responsibilities within the CCP team. CCP currently employs two part-time curators (Managing Curator and Associate Curator) who fulfil slightly different roles with a degree of overlap. The Managing Curator’s key role is to manage the CCP’s Exhibition Program. Key responsibilities are to collaborate with artists in the CCP exhibition program, and to respond to media enquiries, such as providing journalists with information and images. The Associate Curator’s key responsibility is to conceptualise, plan and manage the CCP’s curated exhibition program. This includes selecting which artists to exhibit, developing methods to present individual artwork, and writing and publishing catalogues. The following Art Industry sample questions have been designed for Studio Arts teachers and students to consider in response to FAST gallery visits and online resources. How has the exhibition artwork been displayed? - the navigation of the gallery for viewing? - the longevity and integrity of the artwork? - the vision of the gallery? What does this exhibition design communicate to the viewer? How? How has this exhibition been promoted and marketed? Compare and contrast two FAST galleries in terms of their roles within the Fitzroy art scene and the art industry. Describe the difference between a public and commercial art gallery. Describe the difference between a public gallery and artist-run initiative. Do any of the FAST galleries maintain a permanent collection? Name a gallery in Melbourne that does, and discuss the nature of that collection. View a current exhibition at CCP and Sutton Gallery. How are the artworks presented to the public? Describe the process involved in developing and installing these exhibitions. What kinds of opportunities are there in Fitzroy for emerging artists to exhibit their work? What steps could they take to apply for and secure a venue to display their work? View a current exhibition at SEVENTH gallery. How are the artworks presented to the public? What budget did the artist need to have? Provide another option for presenting the same work. How does Sutton Gallery promote their stable of artists? Describe some of these tactics. In an essay, discuss and evaluate the type of work of one gallery director interviewed in the FAST O&A. What do you think are the most rewarding and challenging aspects of their role? What do you think are the main factors that have made Fitzroy a successful context for exhibiting contemporary art? Describe, using specific examples, two factors that must be considered in relation to the display of artwork. Discuss the role of lighting, temperature, handling and materials in relation to the conservation and preservation of artworks. Outline the duties of the curator in developing and presenting an exhibition. 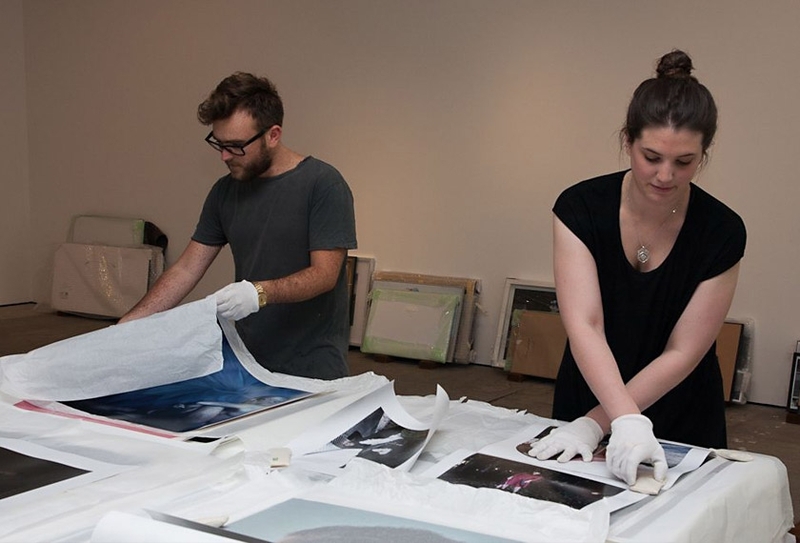 Describe typical methods of handling framed and unframed photographic prints during the installation of CCP’sKodak Salon exhibition. What are three common methods used by artists to present and install their artworks at CCP? Compare and contrast these methods in terms of their potential (strengths and weaknesses) to conserve and preserve the artwork. Identify and discuss the preservation and conservation issues in relation to contemporary art. Give an example of how three different staff members could have contributed to developing, presenting and promoting an exhibition that you have seen at CCP. How does a contemporary art gallery such as Gertrude Contemporary attract audiences to their exhibitions? Archival materials are characterised by long lasting properties, such as a neutral or slightly alkaline pH level. An art fair is an event, in a temporary space, where galleries from all over the world come together to exhibit and sell artworks. A biennial is an exhibition held every two years. A condition report is a written document recording details about the condition of an artwork over time, including any damage or unusual characteristics, typically used for works on loan from other galleries or collections. In contemporary art organisations, a curator is responsible for the selection and interpretation of works of art through exhibitions, talks and publications. An emerging artist is a practicing artist in the early years of their career (regardless of age), with a growing but modest body of work. An ephemeral artwork is one that is made to last for a short time. An established artist is a practicing artist who has reached a mature stage within their career, often with some national and/or international recognition. An exhibition proposal is a written plan for a proposed exhibition generated by artist/s or curator/s. This may include the formal and conceptual ideas of the show, the budget if necessary, and the list of works. The person, usually a director, who operates a commercial art gallery. Gallery etiquette is a group of expected behaviours specific to the gallery space, such as no touching artworks. A group exhibition is a single exhibition where artworks by two or more artists are displayed together. All materials contain inbuilt physical properties (inherent vice), which lead to their deterioration over time. An installation is a form of artwork or art display that is site-specific. Installation art is often of an ephemeral nature and frequently employs non-traditional materials. A mid-career artist is a practicing artist who has generated an extensive body of work over at least a decade, typically with several solo exhibitions and recognition within the local art industry. An opening night is a celebratory event to mark the first public showing of an exhibition. Photomedia is defined as either photography or video art that includes, but is not limited to, analogue photography, digital photography, photograms and digital video. A pop-up show is a short exhibition held at a non-traditional venue. Preventative conservation is a range of proactive measures that may help to delay the natural or accidental degradation of artworks. Print media is a form of communications printed onto paper rather than broadcast or transmitted electronically. For example, printed catalogues, photographs, newspapers, magazine, flyers and posters. Remedial conservation is a range of actions applied to artworks to address damaging processes, often needed when an item is in a fragile condition and/or deteriorating quickly. A retrospective exhibition aims to represent an established artist’s body of work, rather than just focussing on their most recent work. Social media is an electronic form of communication in which individuals and organisations form online communities to share information, ideas and messages. A solo exhibition features the work of a single artist. A stable of artists is a group of artists associated with a particular commercial gallery. Time-based media are artworks that are can be experienced over time, including sound, video, slide shows and performance. Wall text is the identifying text for an artwork typically displayed on the gallery wall alongside the art. Wall text usually includes the artist’s name, title of the work, dimensions, media, date created, the artwork’s owner and, in some cases, a block of text interpreting the artwork. through the Strategic Partnerships Program.